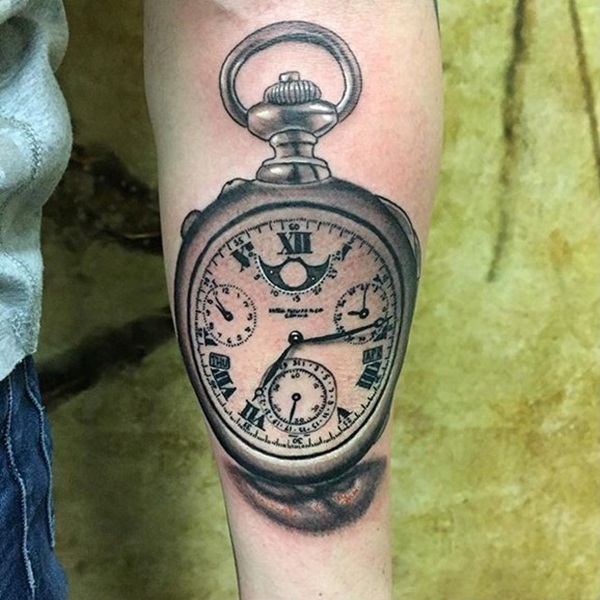 Pocket watches carry a charming heir of antiquity in their appearance. 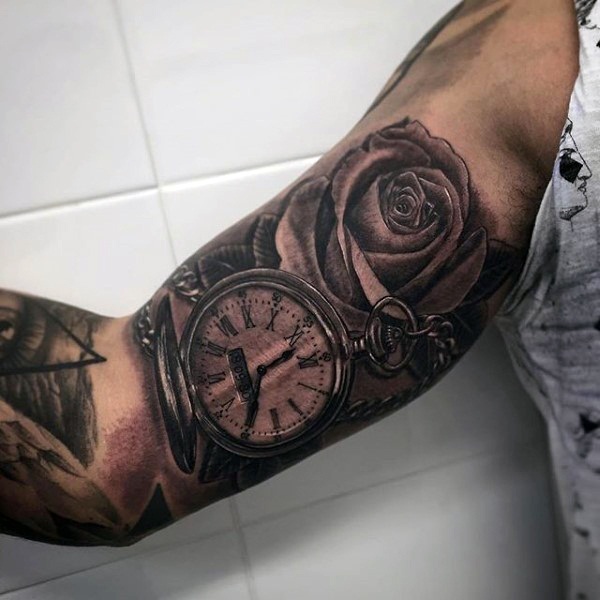 First introduced in the 17th century they quickly became popular with the upper class and subsequently became popular with the other classes once technology improved that made the pieces more affordable. 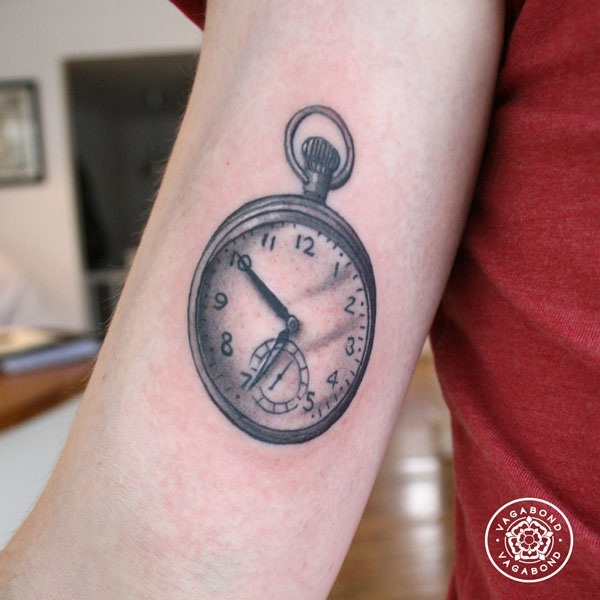 For almost three centuries the pocket watch was the standard for portable timekeeping until the advent of WWI. 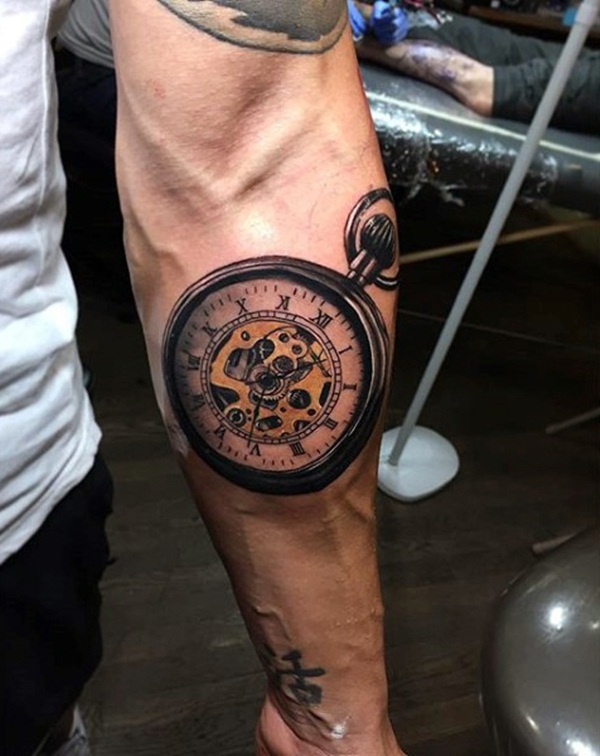 The military realized a pocket watch was impractical in battle and issued soldiers a pocket watch/wrist watch hybrid known as the trench watch instead. 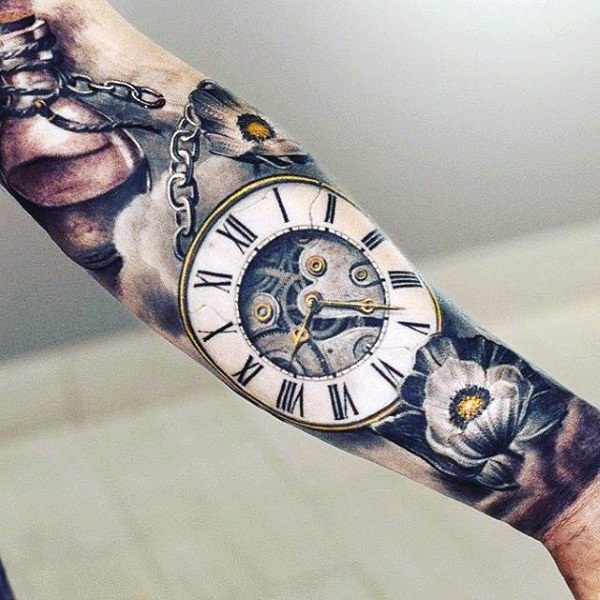 Shortly after WWI the wrist watch surpassed the pocket watch in popularity and the pocket watch became a beautiful but obsolete reminder of the world as it used to be. 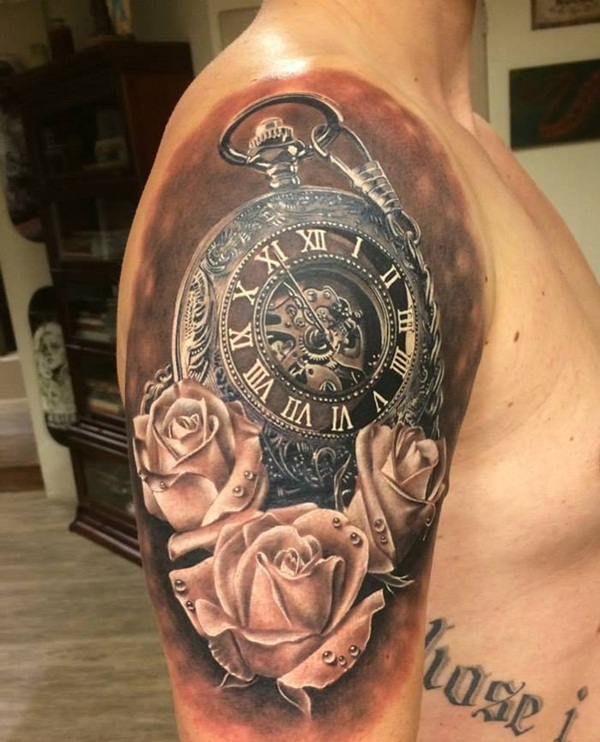 A pocket watch surrounded by three roses is depicted on the wearer’s forearm in this black and gray tattoo. 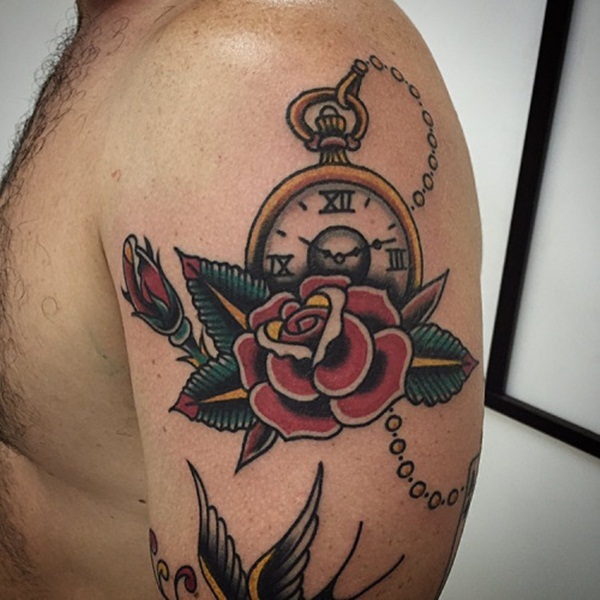 A pair of roses accent a pocket watch in this tattoo that is colored in a style reminiscent of oil paintings. 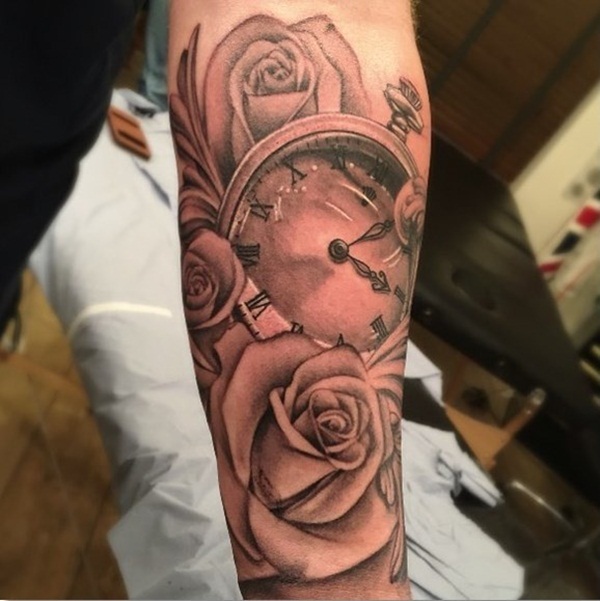 This realistic tattoo uses black, gray, and white ink to depict a reflective pocket watch and a rose with two water droplets on its petal. 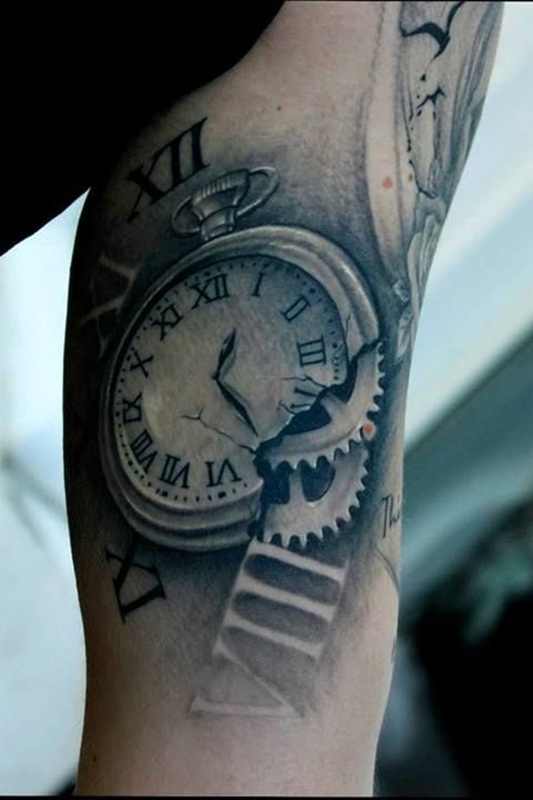 The face of the pocket watch is broken and exposes the gears underneath in this black and gray tattoo rendered on the wearer’s arm. 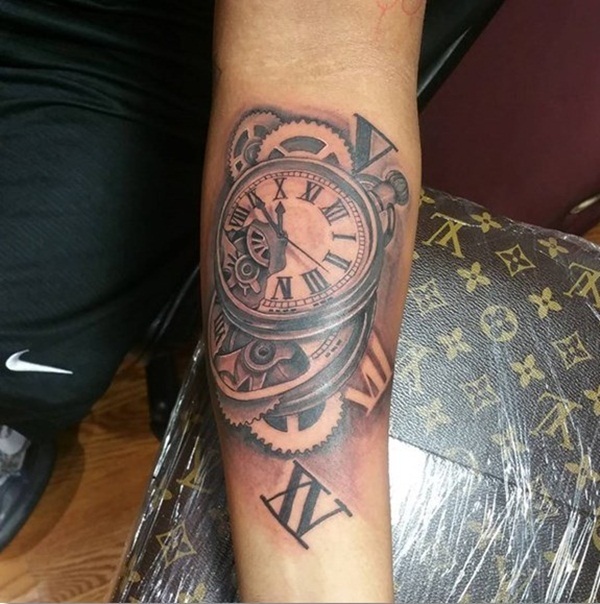 A pocket watch is depicted with gears too big for the body and is surrounded by roman numerals in addition to pair of birds. 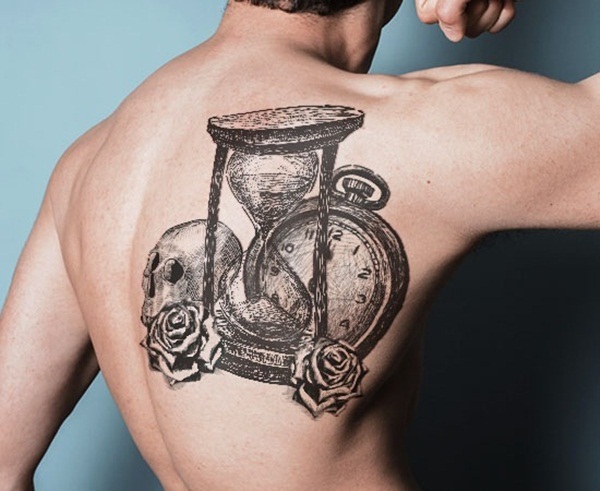 A skeleton pocket watch sits underneath a large rose in this black and gray tattoo rendered on the wearer’s upper arm. 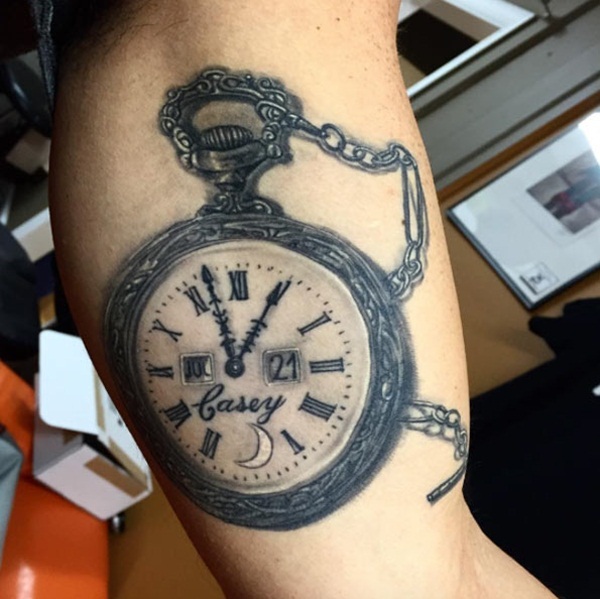 A pocket watch with “Casey” written on the face is rendered in black and gray ink. 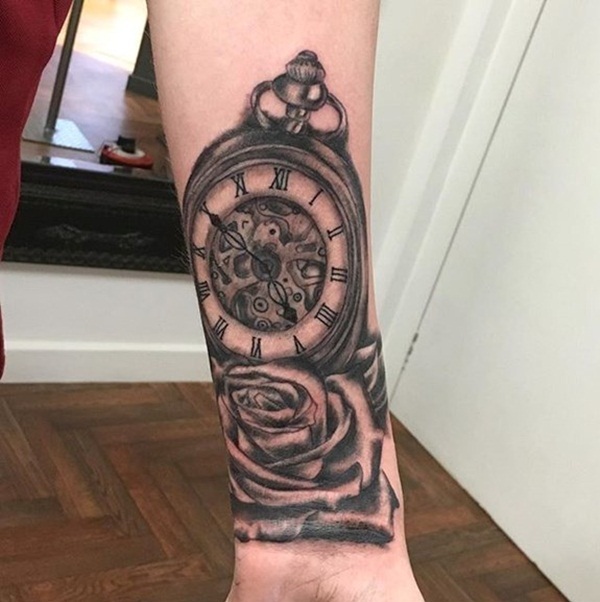 A pocket watch and rose are depicted over a black background in this black and gray tattoo located on the wearer’s forearm. 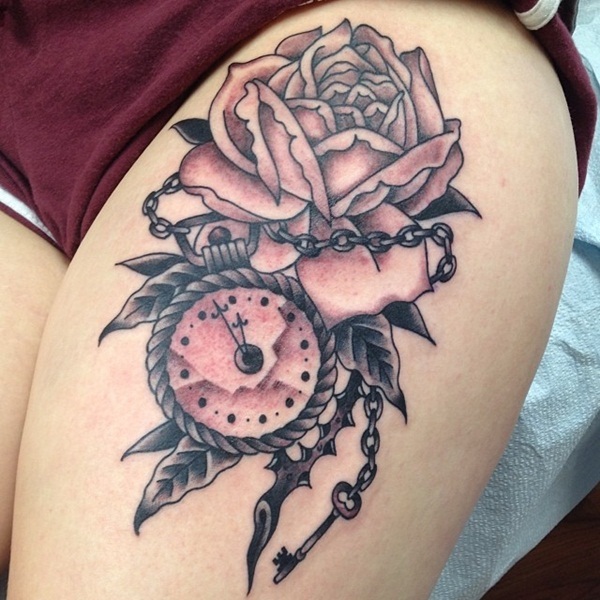 A stylized pocket watch is accompanied by a pair of roses over a dark background in this black and gray tattoo located on the wearer’s arm. 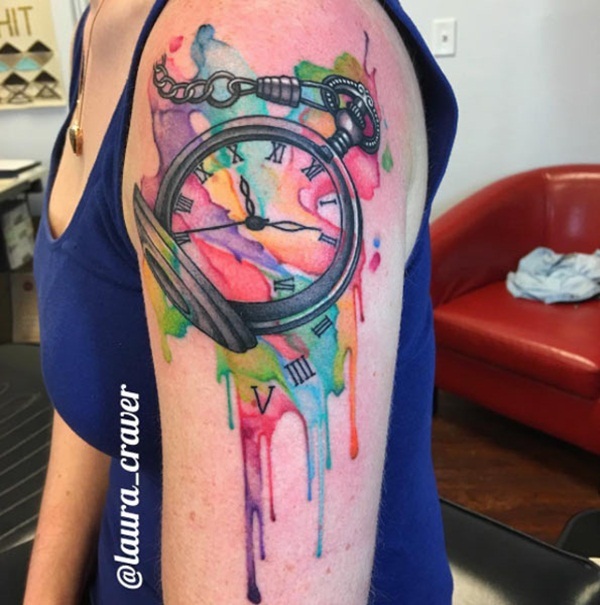 A black and gray pocket watch is depicted over a smear of various watercolors in this tattoo located on the wearer’s upper arm. 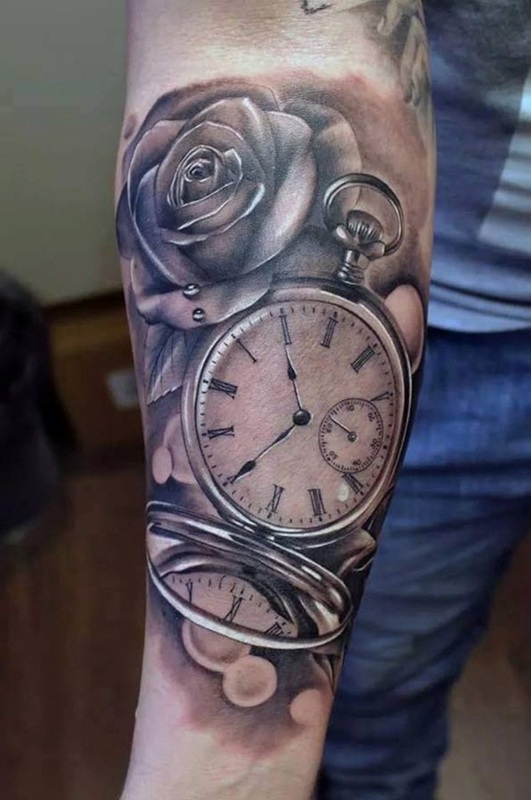 A simplified depiction of a rose and pocket watch are rendered in black and gray ink on the wearer’s forearm. 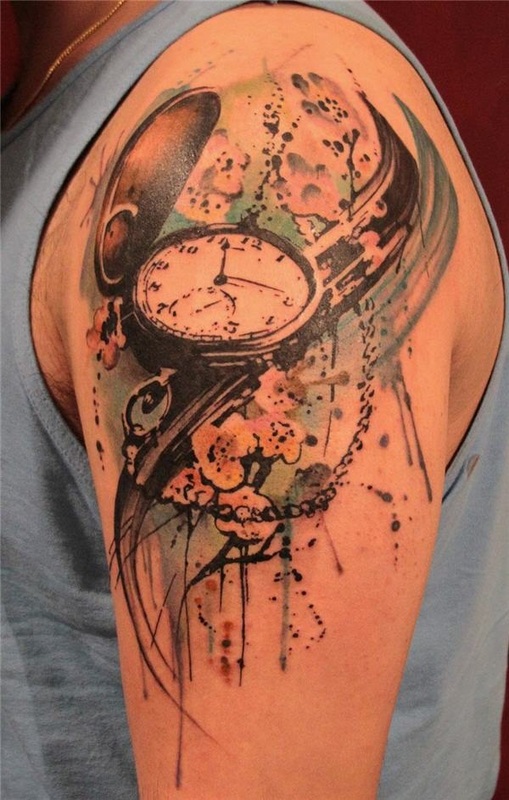 This beautiful abstract piece depicts a black pocket watch over a smear of watercolors and watercolor blots. 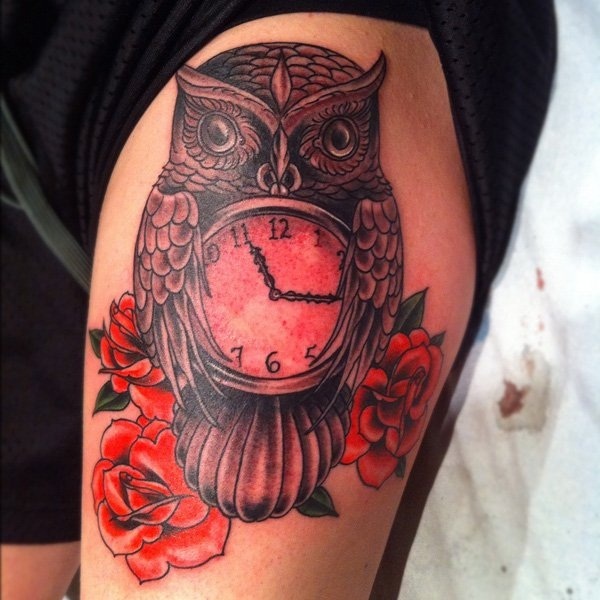 An owl with a clock on its chest is accented by a trio of roses in this tattoo utilizing a predominantly red color palette. 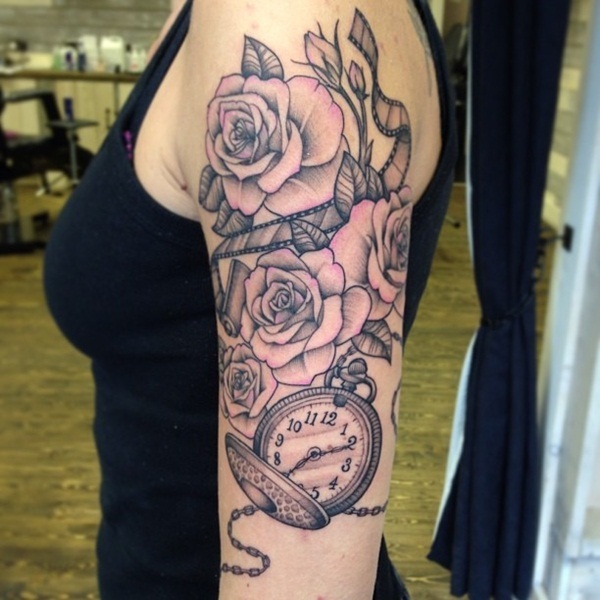 Two pink roses accent a heart-shaped black and gray pocket watch in this forearm tattoo. 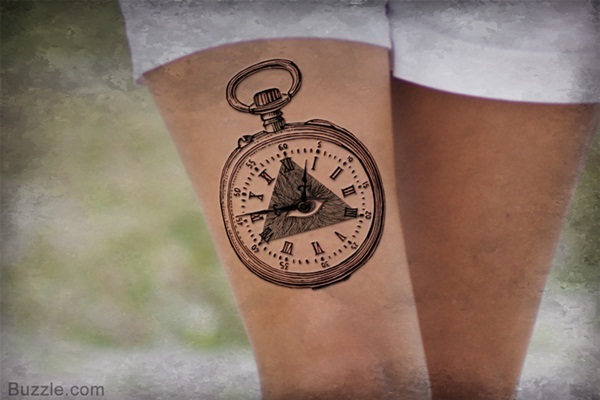 A triangle containing the “All seeing eye,” is depicted on the face of the pocket watch in this black and gray tattoo. 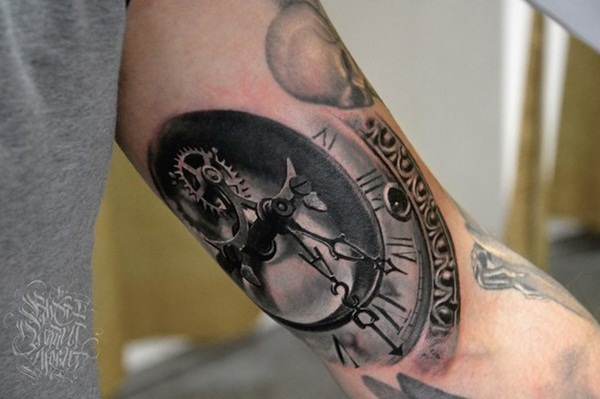 A semi-opened face pocket watch is depicted over a background of gears and roman numerals in this black and gray forearm tattoo. 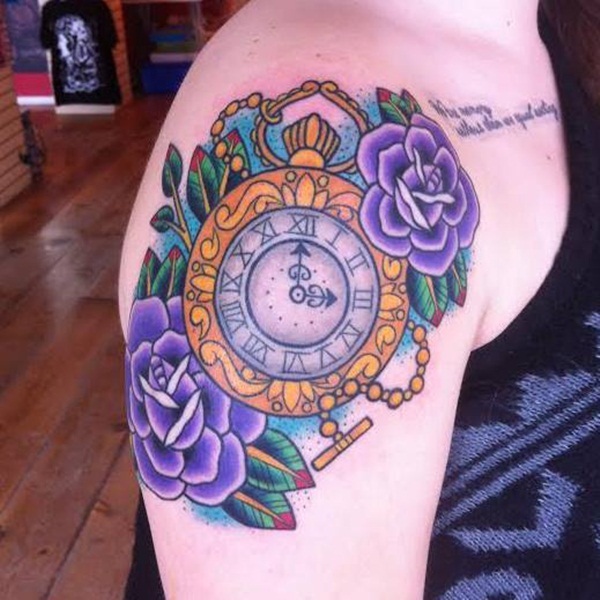 This traditionally styled tattoo shows a gold pocket watch with elaborate designs around the face between two purple flowers over a blue background. 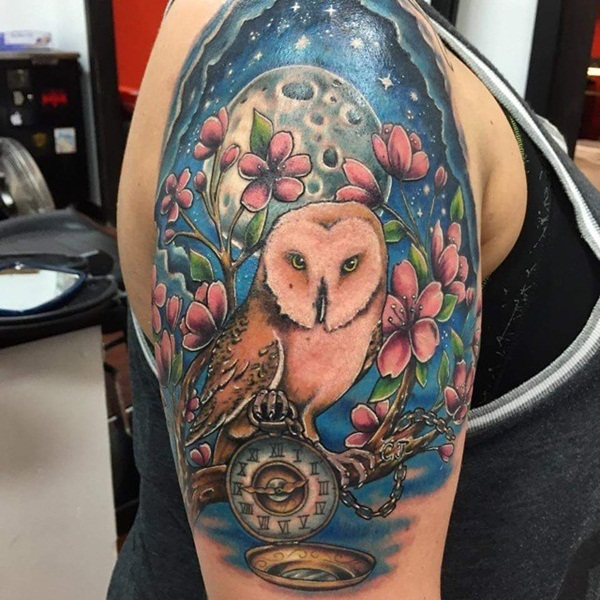 An owl resting it’s foot on a pocket watch is surrounded by pink flowers while the moon and stars gleam in the background of this colorful tattoo. 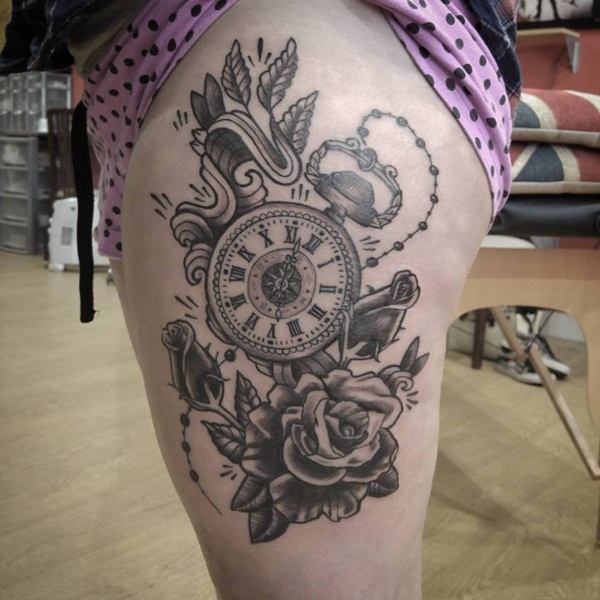 A pocket watch is accompanied by two unopened and one open rose in this black and gray thigh tattoo. 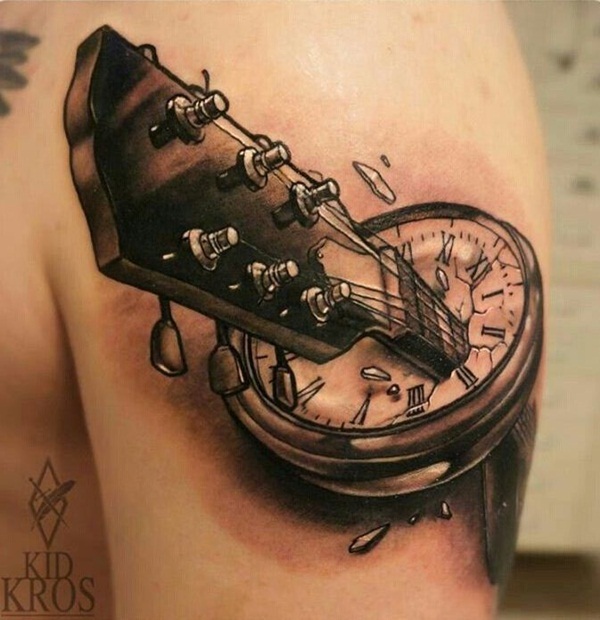 A guitar head is depicted smashing through the face of a pocket watch in this black and gray tattoo. 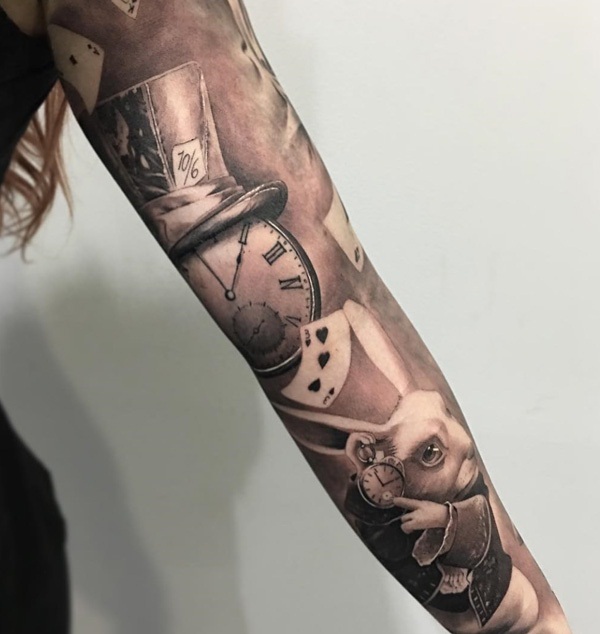 This Alice in Wonderland inspired tattoo portrays a pocket watch wearing a top hat and a white rabbit holding a pocket watch. 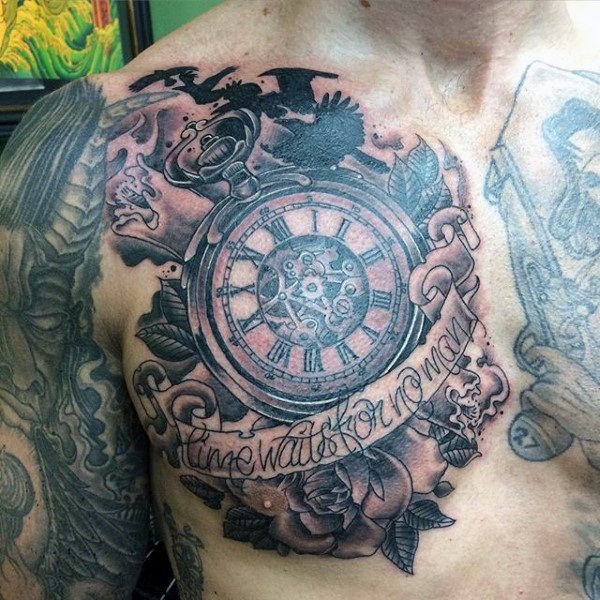 A broken pocket watch is depicted over a swirling grey background in this chest tattoo. 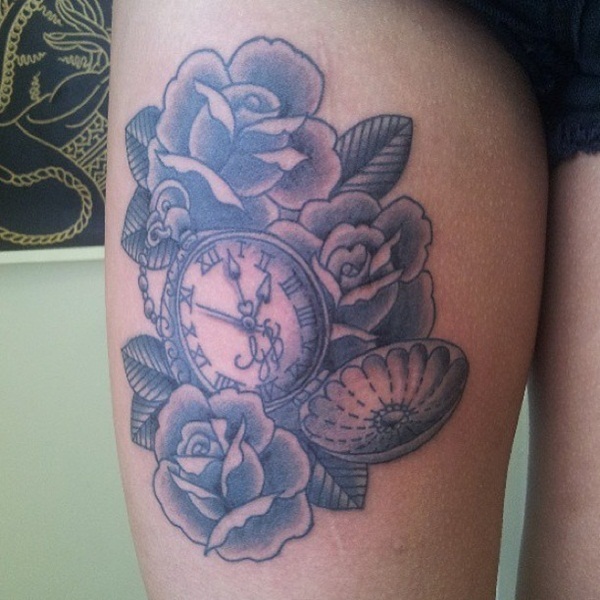 A trio of roses surround an ornate pocket watch in this black and gray leg tattoo. 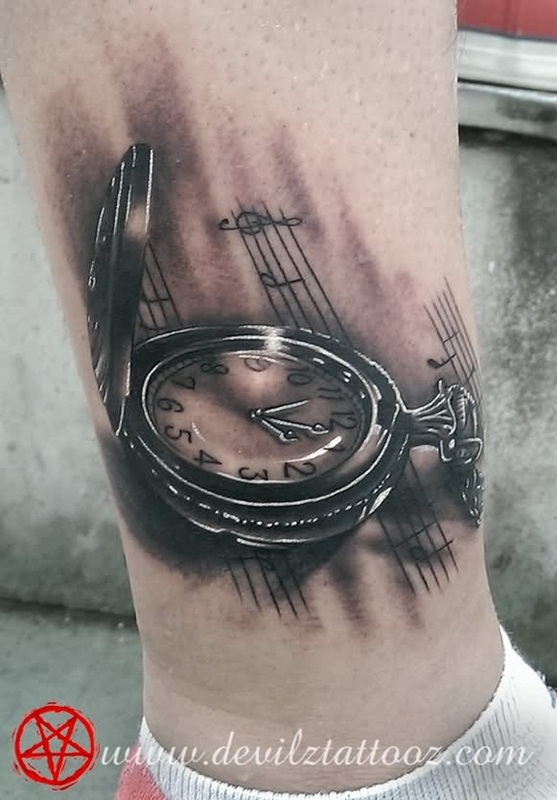 This black and gray tattoo, located on the wearer’s ankle, portrays a shiny pocket watch over musical bars. 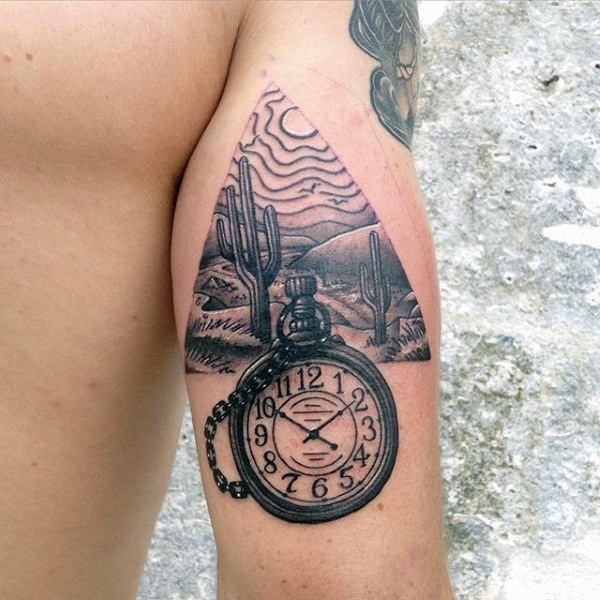 This tattoo utilizes heavy line work to depict a pocket watch underneath a triangular vignette of a desert landscape. 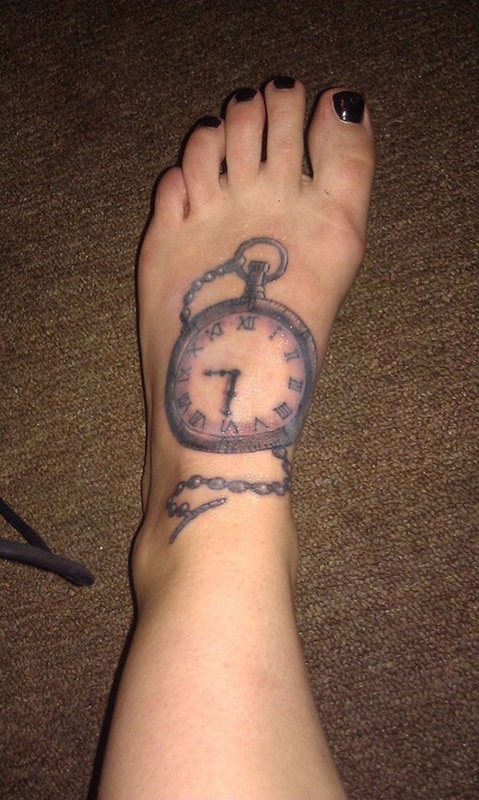 A pocket watch with a broken face and chain is depicted on the wearer’s forearm. 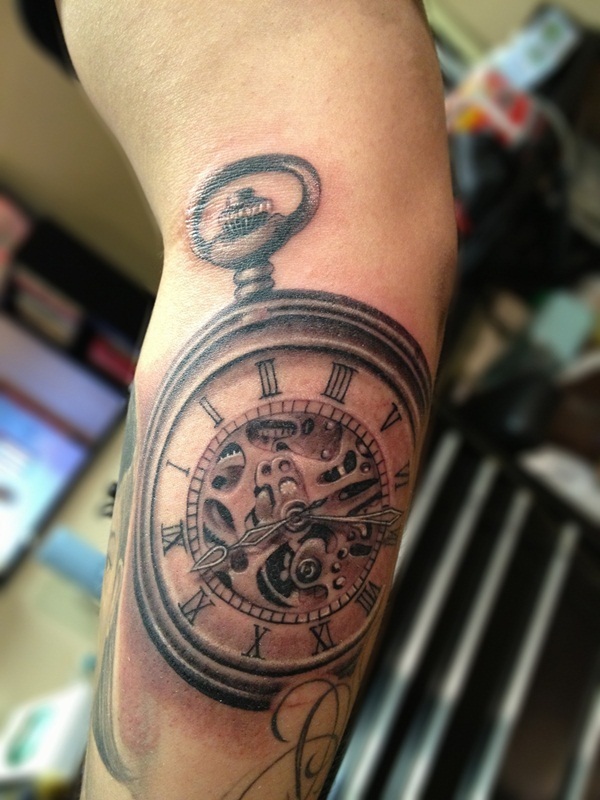 A black skeleton watch with gold mechanisms is depicted on the wearer’s forearm. 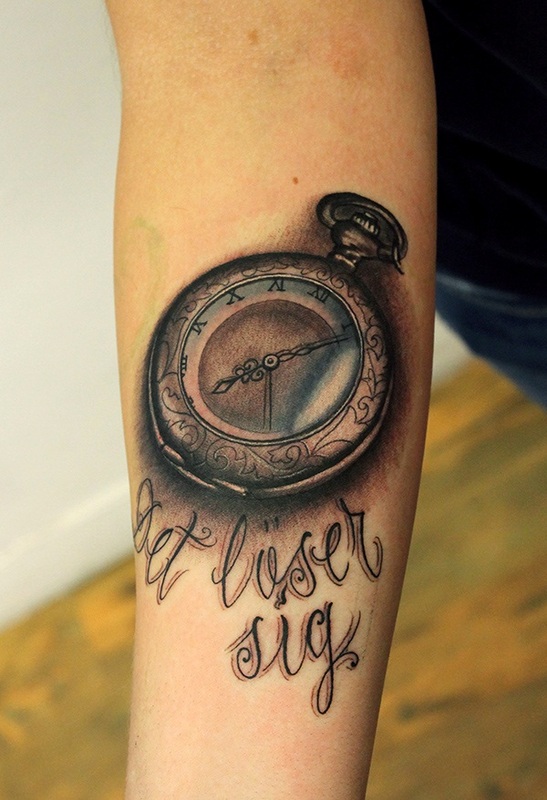 A black and gray pocket watch with blue embellishments is accompanied by the quote, “Det Loser Sig,” translating to, “It dissolves,” on the wearer’s forearm. 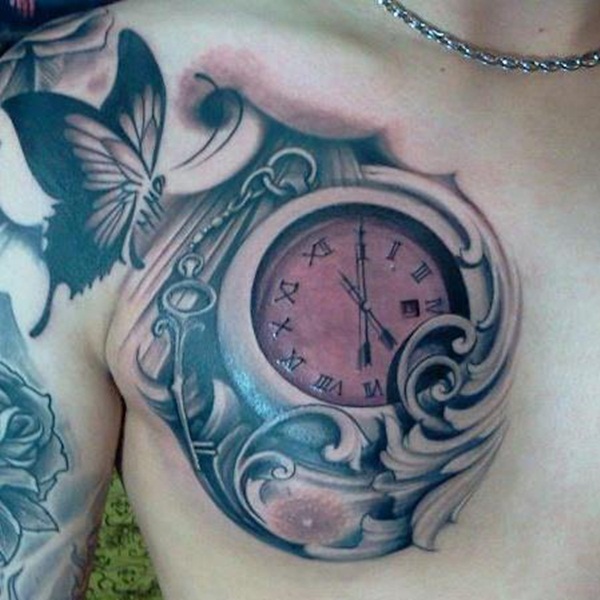 A pocket watch attached to a skeleton key is accented by a butterfly and a swirling design in this black and gray chest tattoo. 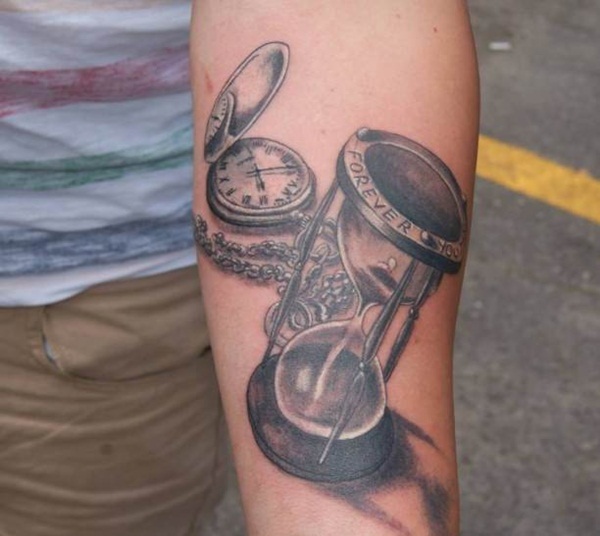 This black and gray tattoo, located on the wearer’s forearm, shows a swirling design wrapping around a pocket watch. 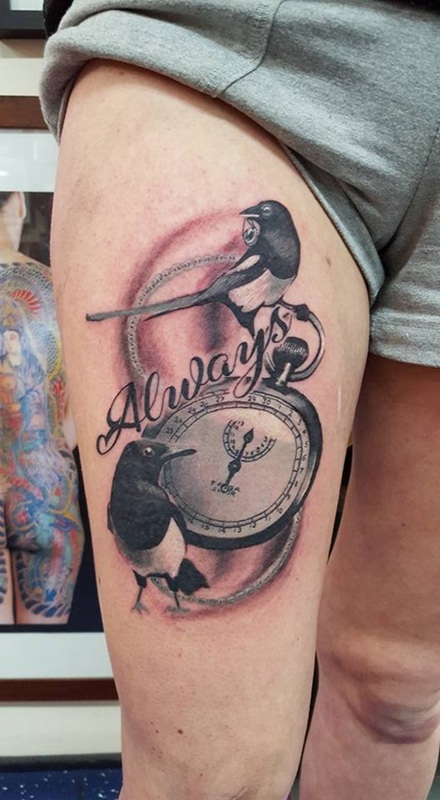 A pocket watch and two birds are depicted with the word, “Always,” in this black and gray tattoo. 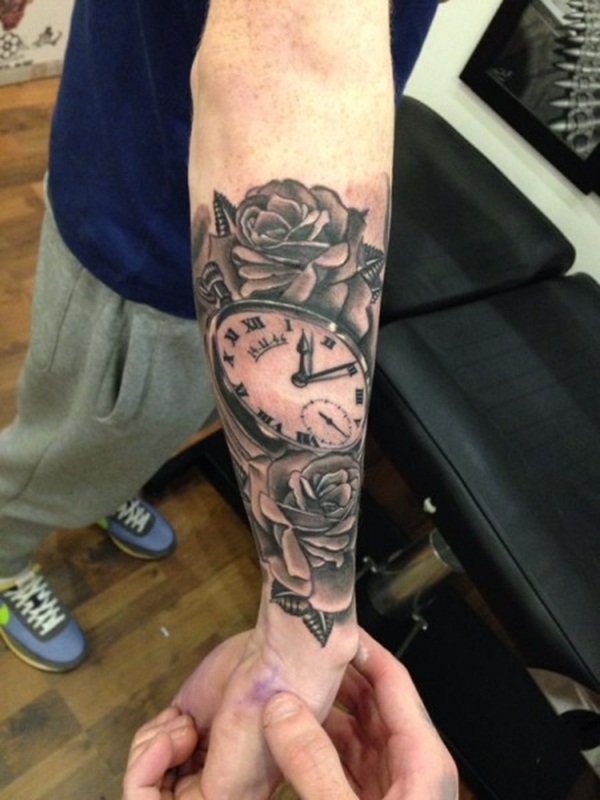 This excessively dark tattoo renders a hand holding a skeleton watch on the wearer’s torso. 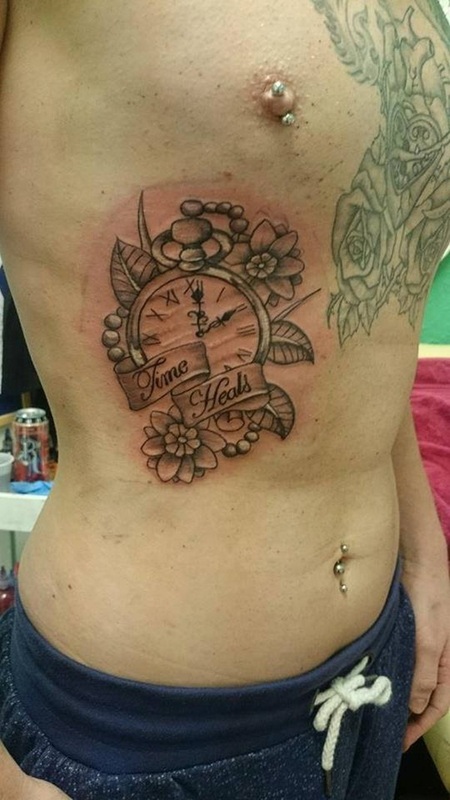 A pocket watch is embellished with two flowers and a banner reading, “Time Heals.” in this black and gray torso tattoo. 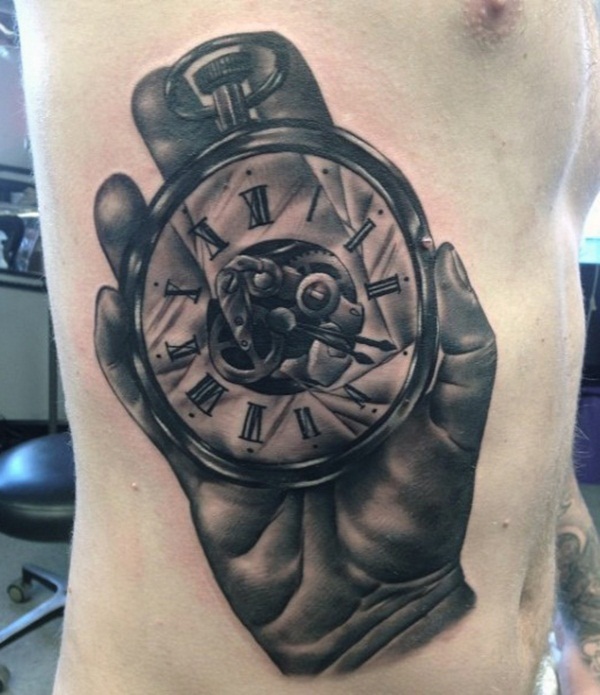 This remarkably well done piece depicts a black and gray pocket watch with hyper-realistic mechanisms. 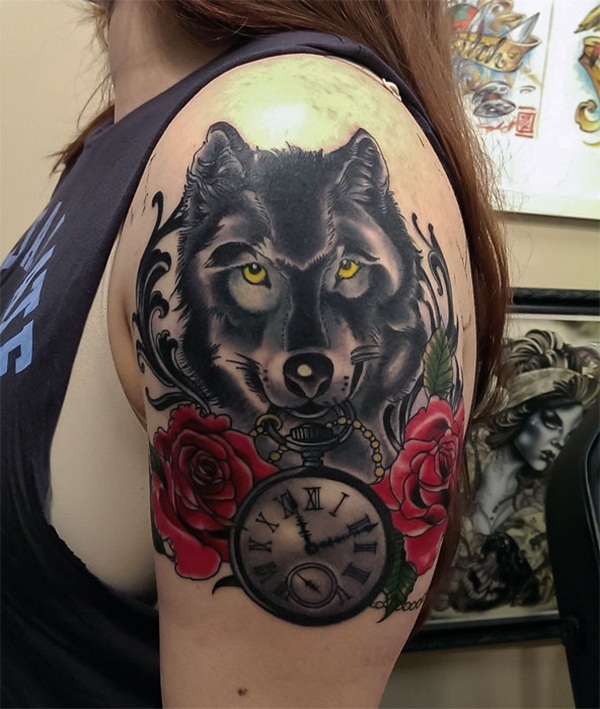 This traditional style tattoo, located on the wearer’s arm, depicts a wolf above a pocket watch and two roses. 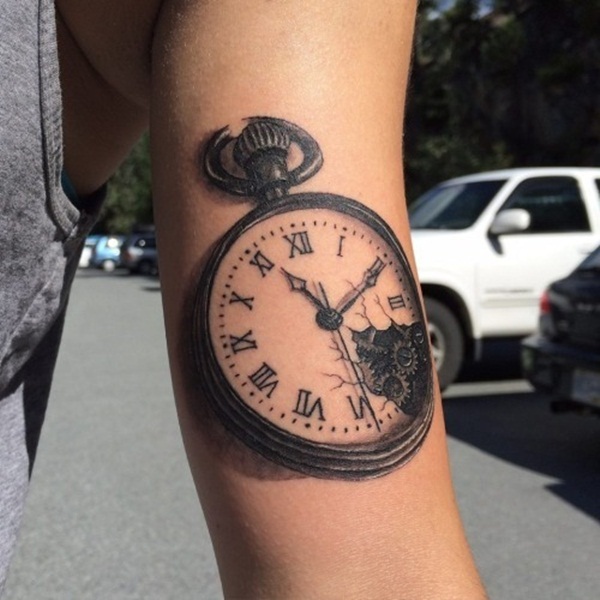 A simple but well done pocket watch is rendered in black and gray ink on the wearer’s forearm. 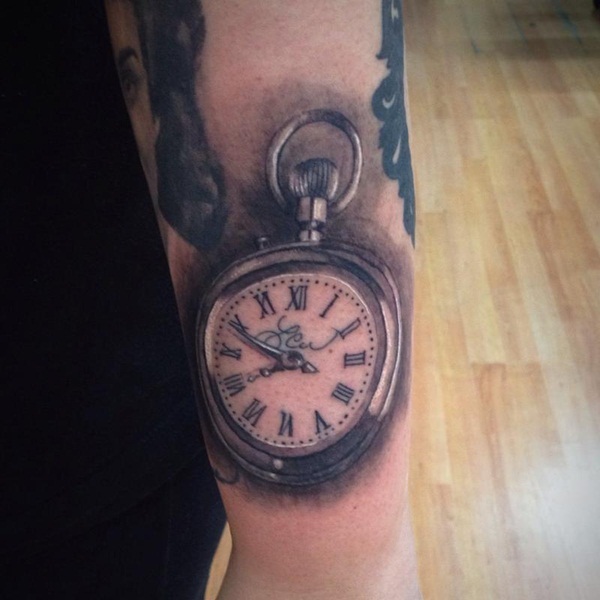 A black and gray pocket watch with the name, “Lew,” scrawled across the face is depicted on the wearer’s forearm. 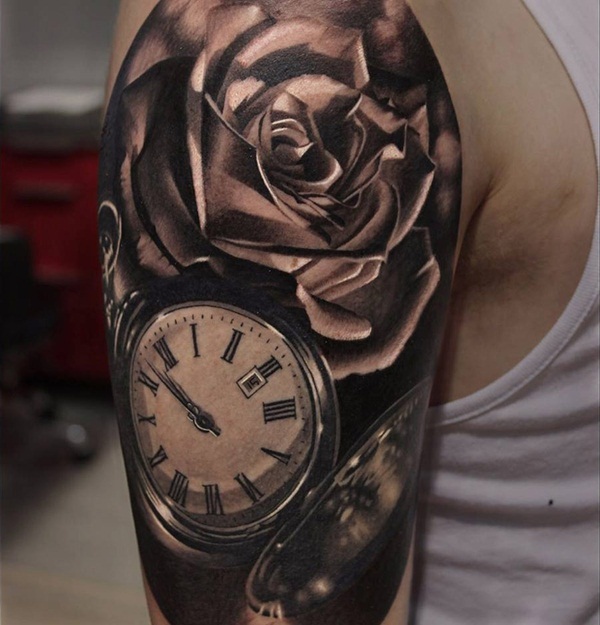 This excessively dark black and gray tattoo pictures a hyper-realistic pocket watch and rose on the wearer’s upper arm. 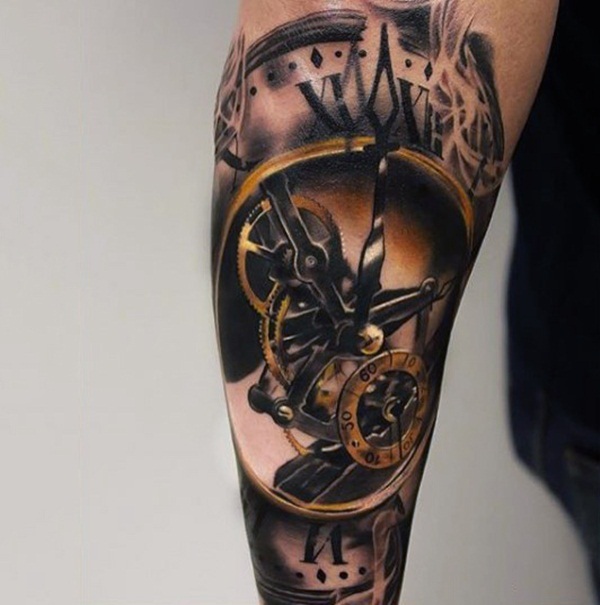 A black and gold skeleton pocket watch is depicted on the wearer’s forearm. 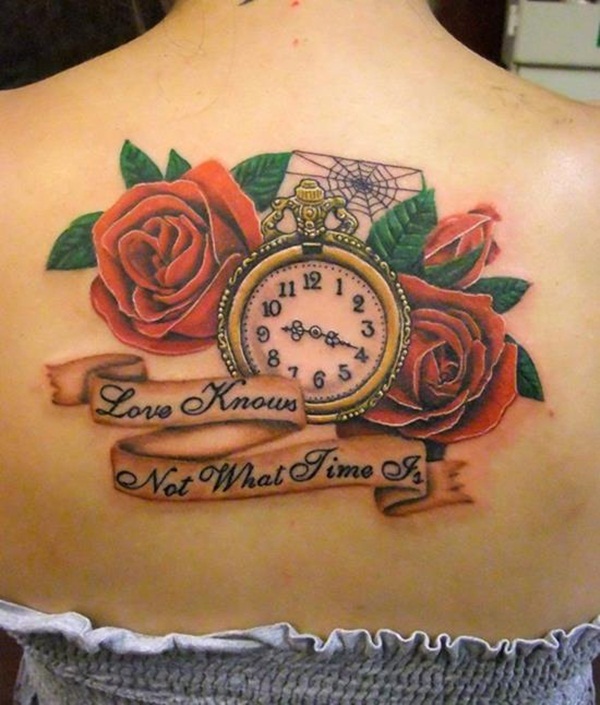 A pocket watch and roses are depicted over a background of sheet music folded into the shape of a rose. 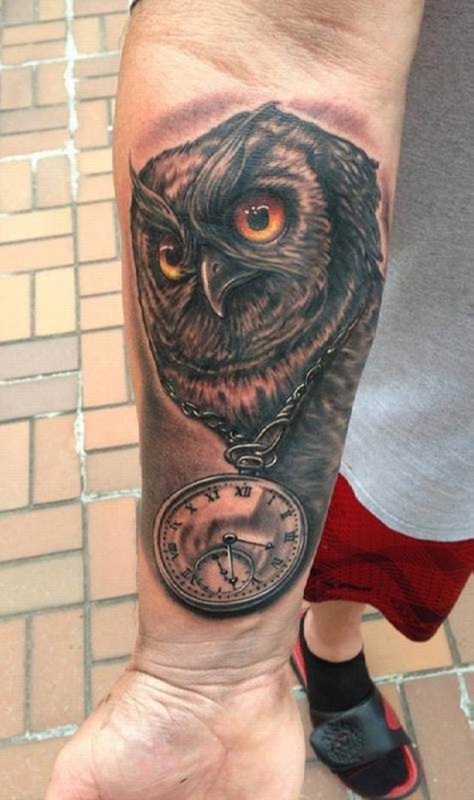 An owl with yellow and orange eyes is depicted wearing a pocket watch chain around its neck in this black and gray forearm tattoo. 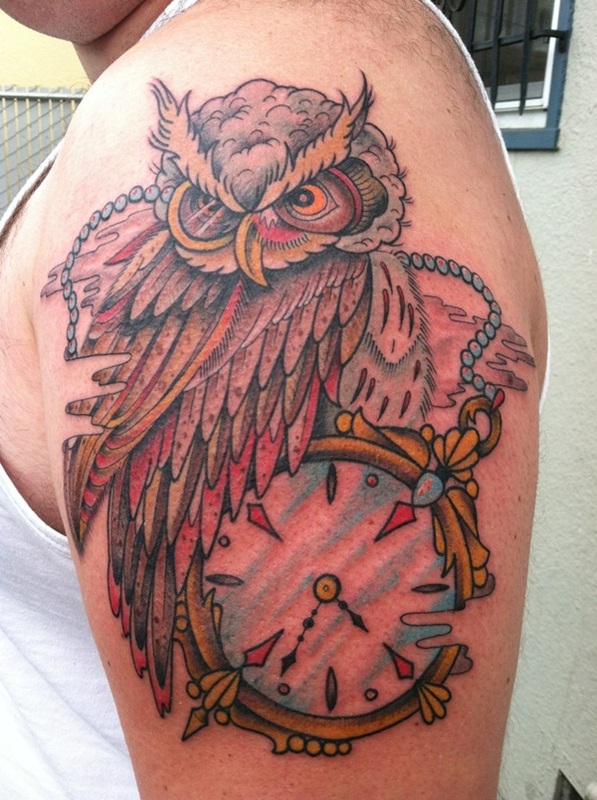 This vibrant piece uses a myriad of colors to accent an owl perched on a gold pocket watch. 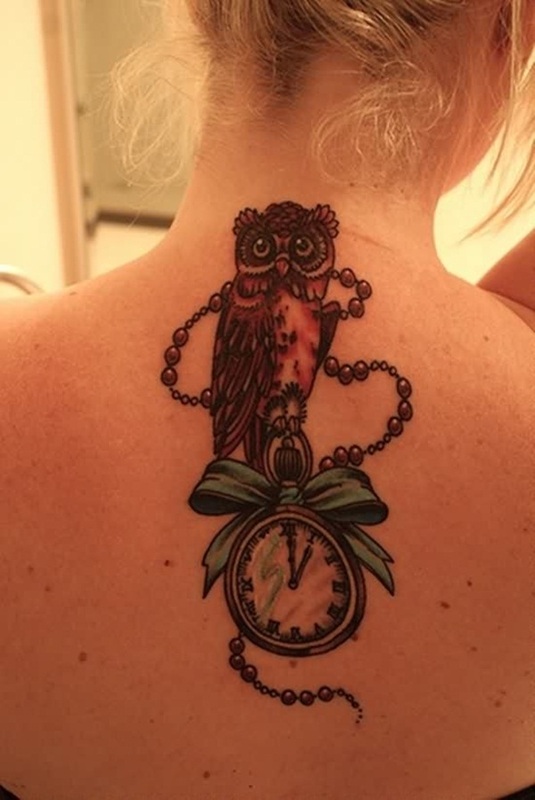 An owl is illustrated perched atop a pocket watch embellished with a blue bow in this back tattoo. 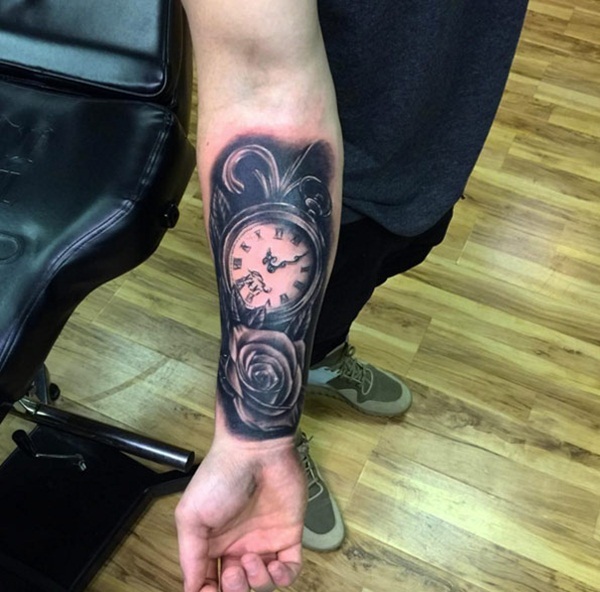 A pocket watch is portrayed between two roses in this black and gray forearm tattoo. 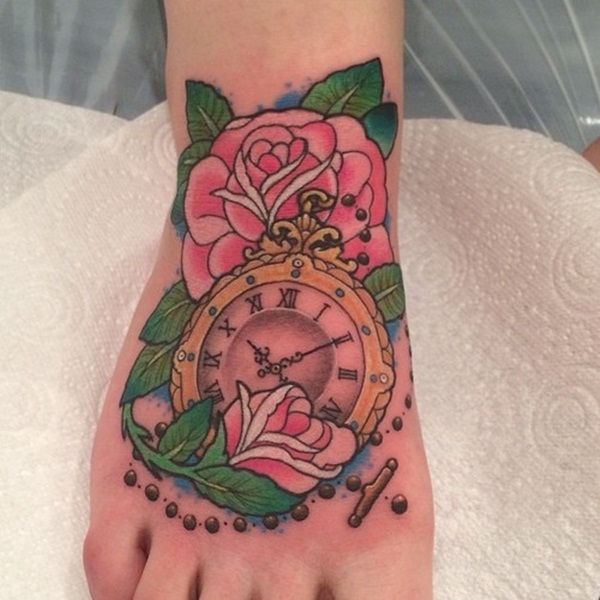 A gold pocket watch is rendered in front of a pink rose in this colorful foot tattoo. 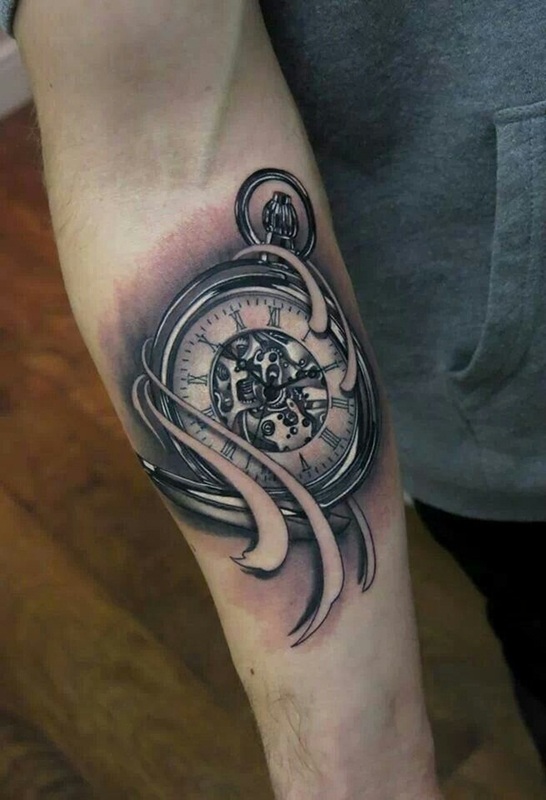 An exceptionally shiny pocket watch is rendered in black and gray ink. 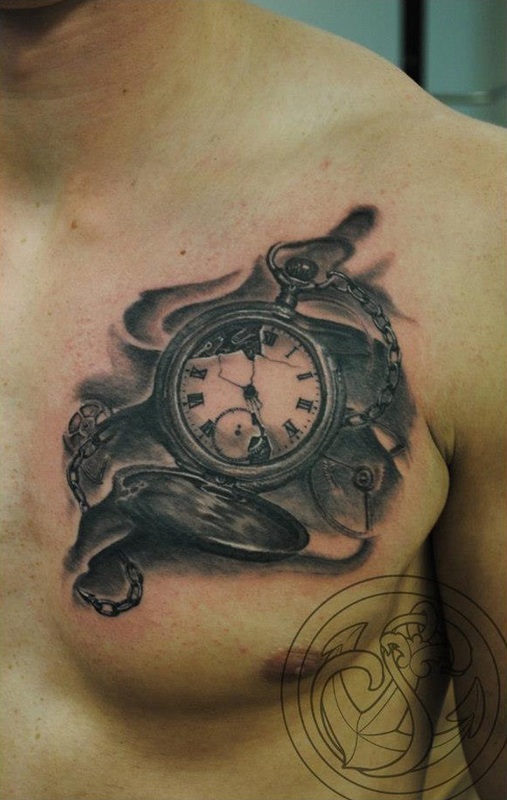 A black and gray pocket watch is portrayed with shattered glass. 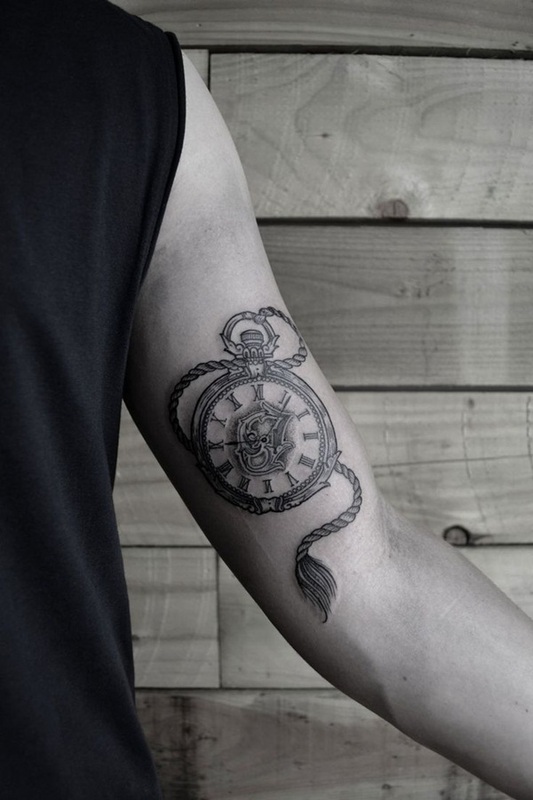 A black and gray pocket watch is depicted with a rope instead of a chain and a design on its face. 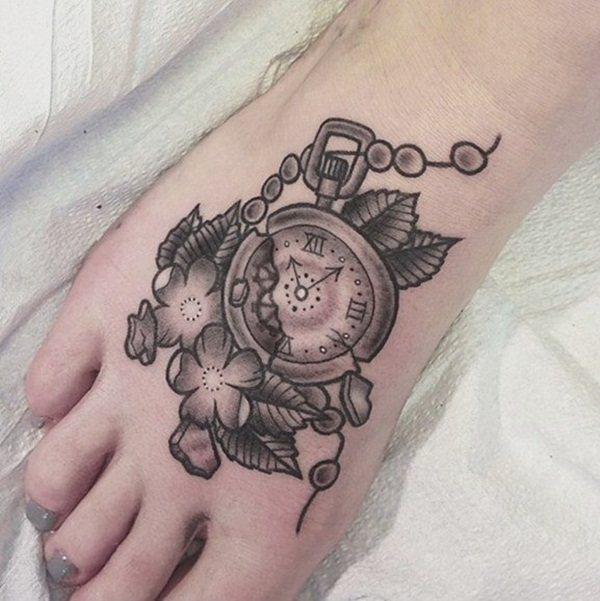 A simplified broken pocket watch is rendered with two flowers on the wearer’s foot. 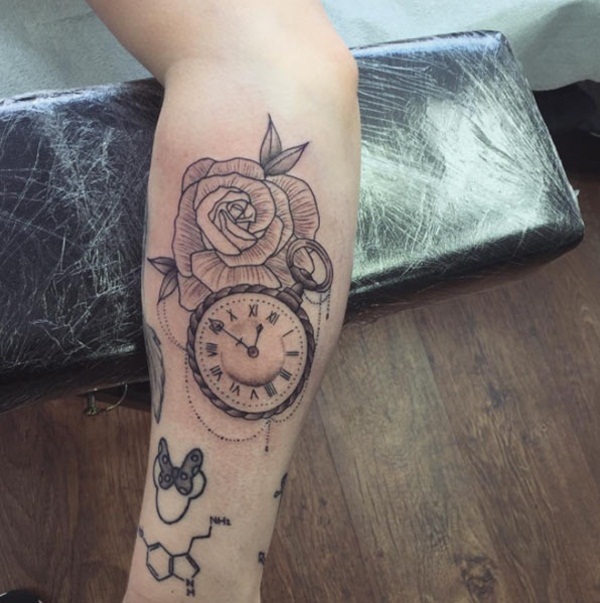 A pocket watch sits next to a skull and behind an hourglass and two roses. 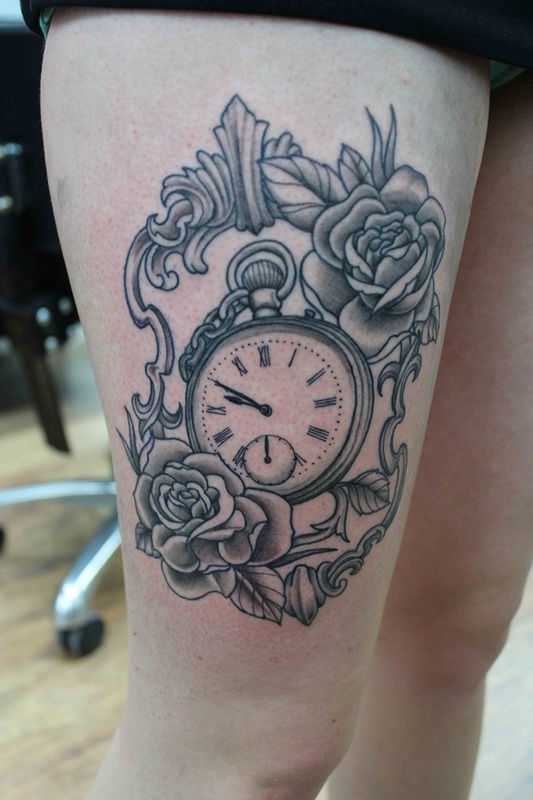 This black and gray tattoo pictures a pocket watch between two roses on the wearer’s thigh. 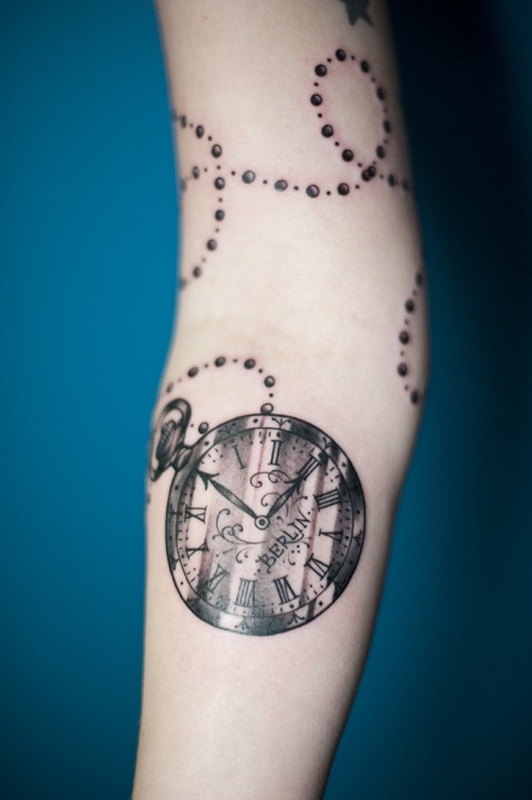 A shiny, engraved pocket watch with the word, “Berlin,” on the face is rendered in this tattoo. 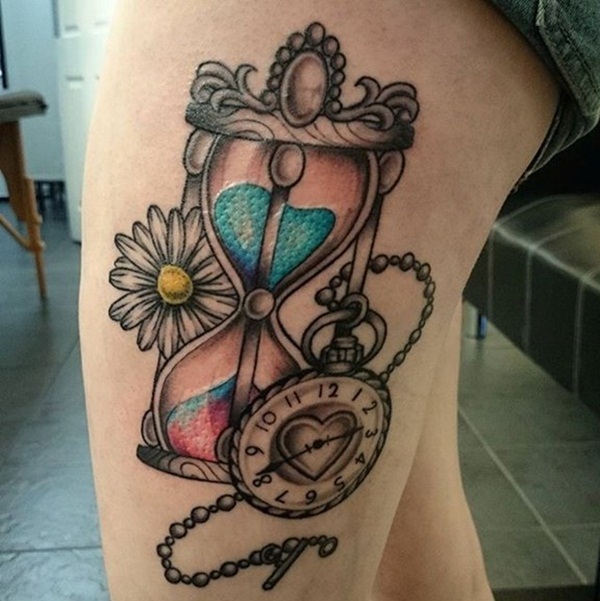 A pocket watch with a heart on its face is accompanied by an hourglass filled with colored sand and a flower with a yellow bud. 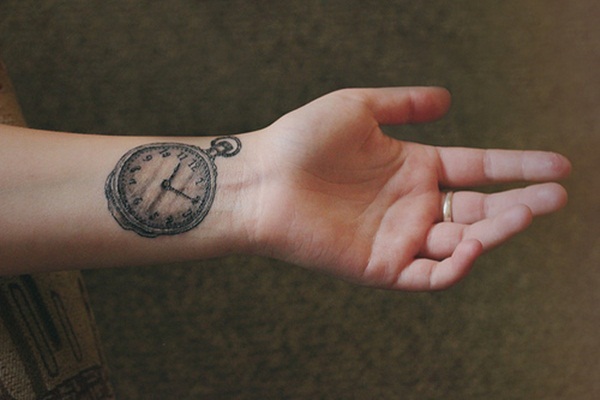 A black and gray pocket watch is illustrated on the wearer’s wrist. 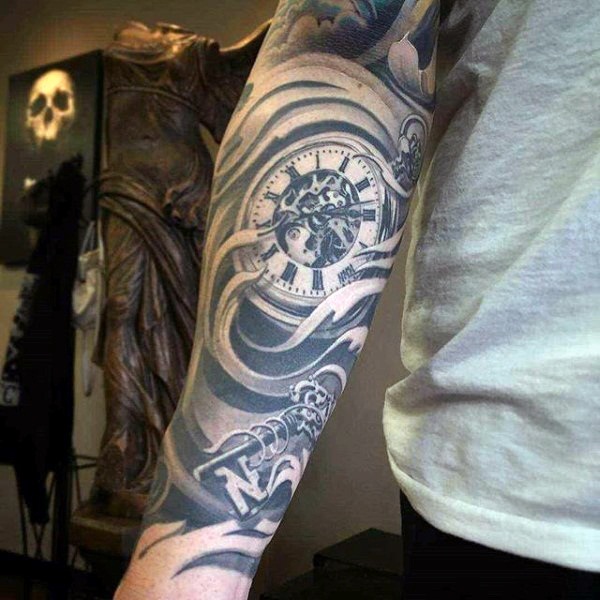 A beautifully done black and gray skeleton pocket watch is depicted on the wearer’s forearm. 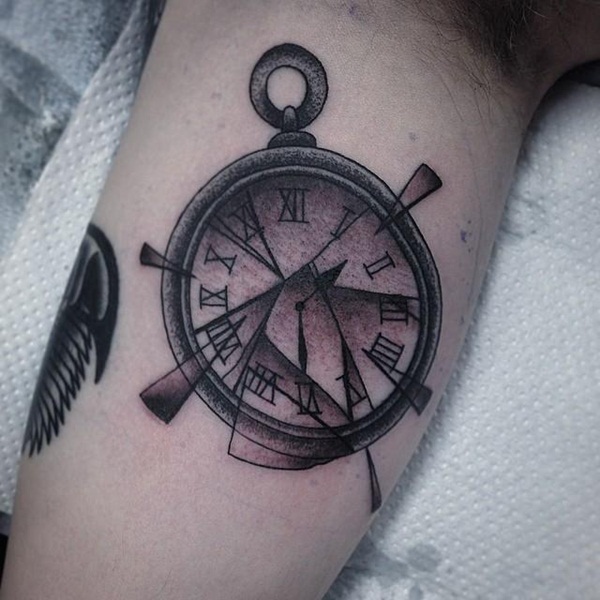 A black and gray pocket watch is rendered on the wearer’s upper arm. 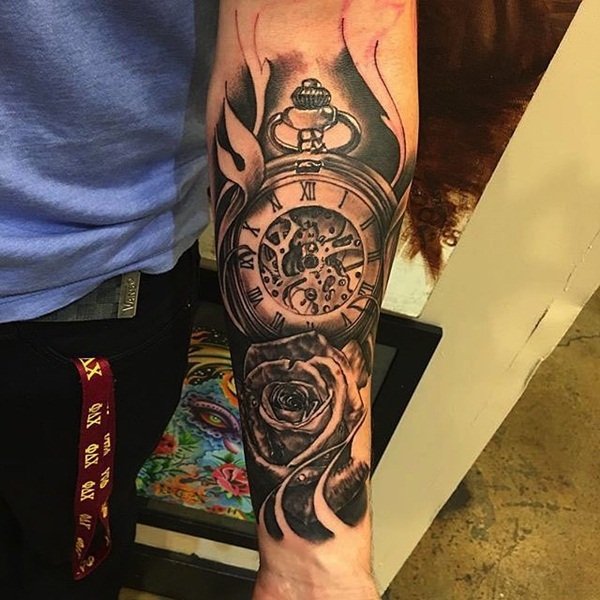 This incredible piece features a hyper-realistic skeleton pocket watch and three white roses accented with water droplets. 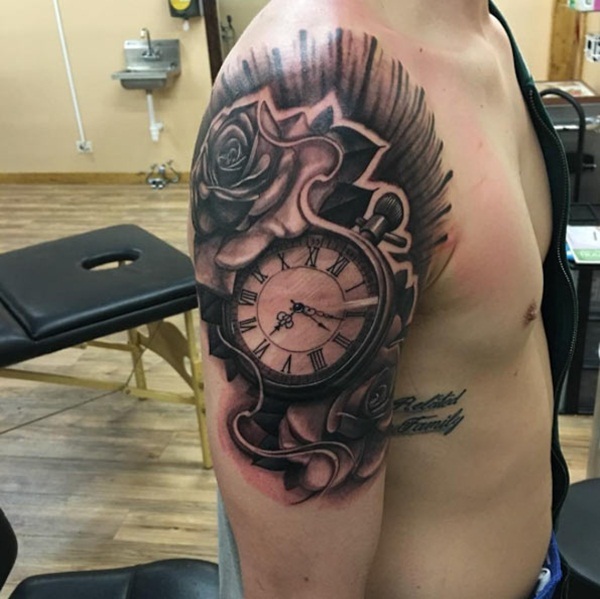 This stylish black and gray piece pictures a rose and a pocket on the wearer’s upper arm. 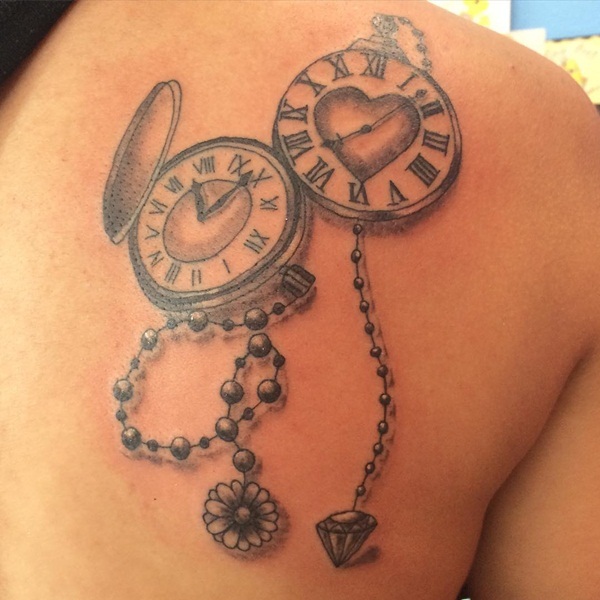 Shaky line work creates a pair of black and gray pocket watches. 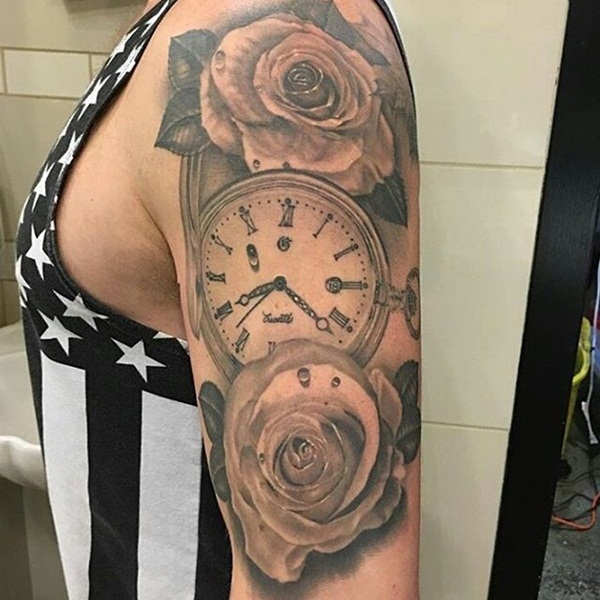 A heart is featured on one watch face with a diamond hanging from its chain while the other watch sports a flower hanging from its chain. 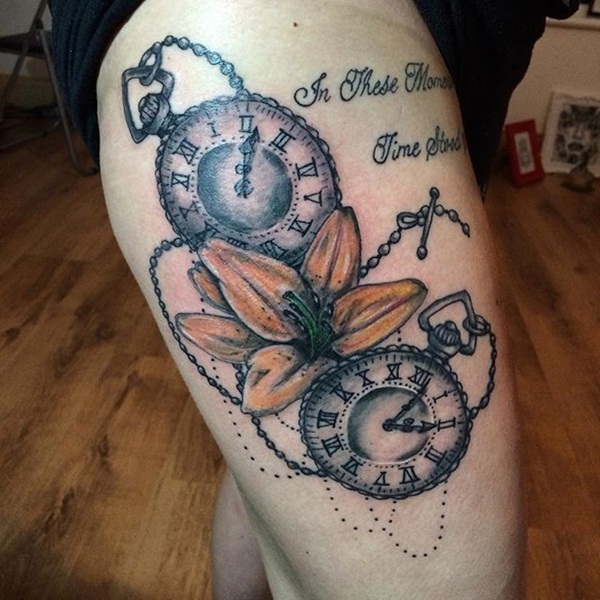 A yellow flower sits between two black and gray pocket watches while the quote, “In these moments time stood still,” sits to the right of the images. 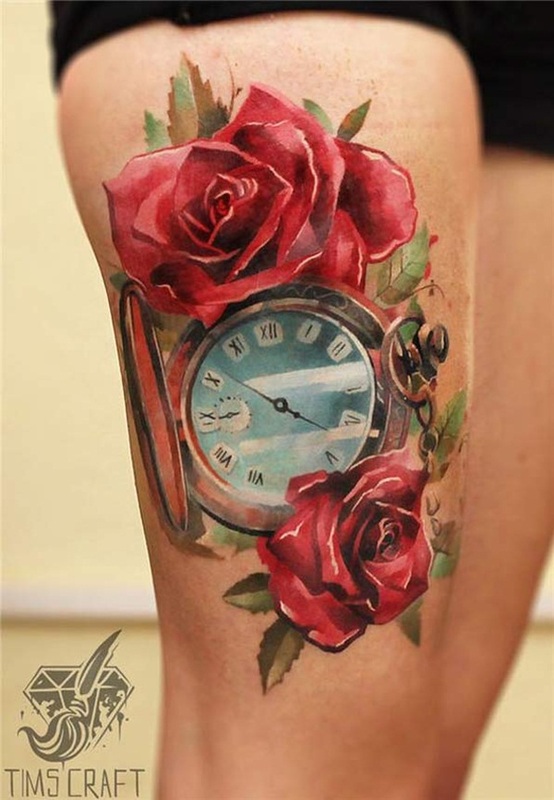 Two red roses and one orange rose surround an engraved, black and gray pocket watch in this piece featured on the wearer’s upper thigh. 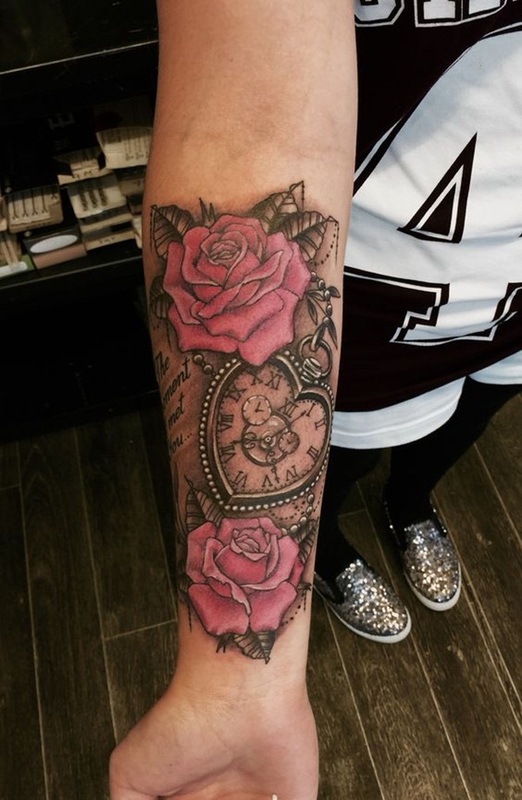 This gorgeous piece features a pocket watch surrounded by three roses. 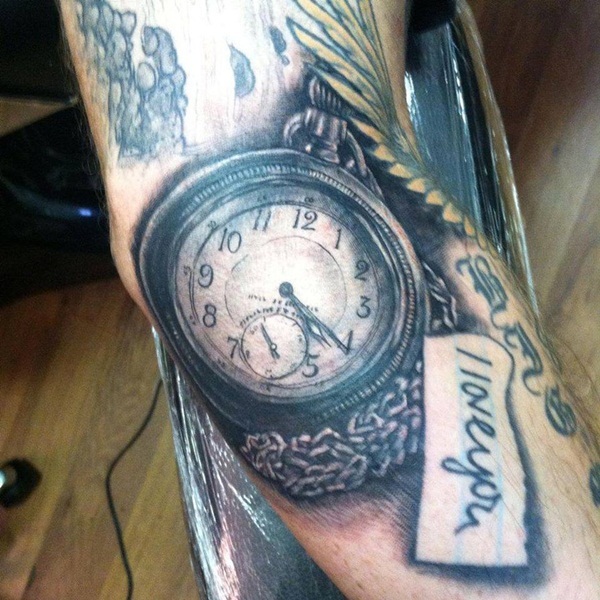 The reflections on the glass of the pocket watch do a phenomenal job of adding depth to the piece. 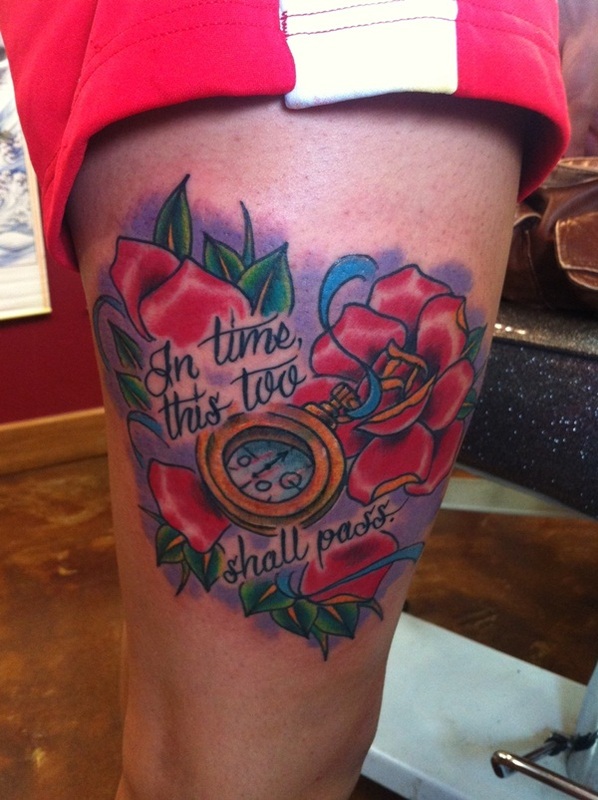 The color distribution of this piece makes the images of a pocket watch and roses a bit muddled. 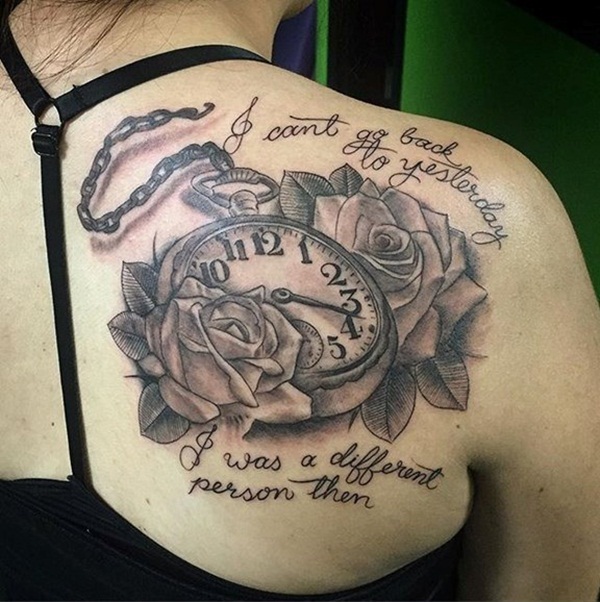 A quote sits between two roses in this back piece. 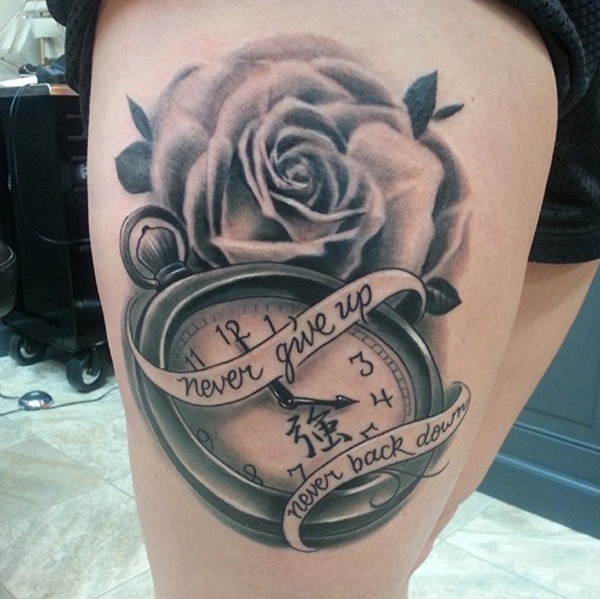 A pocket watch is wrapped in a banner reading, “Never give up, never back down,” and is accented by a rose in this black and gray piece. 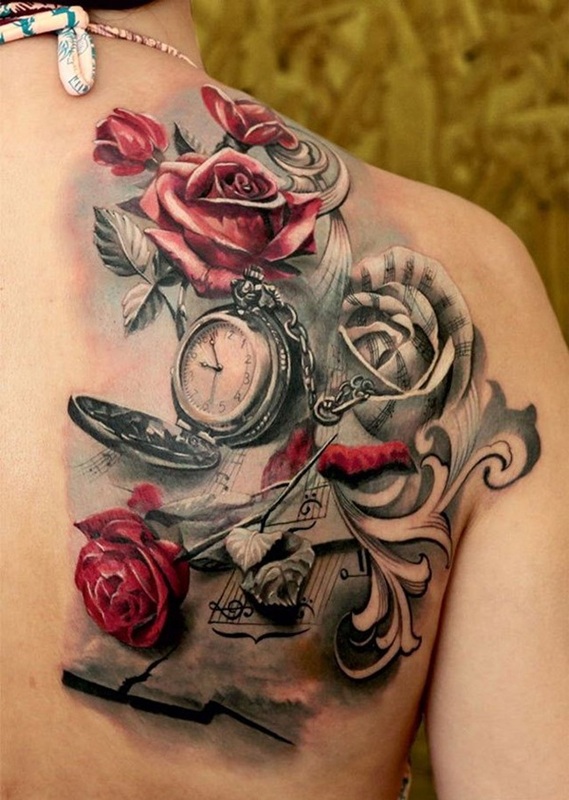 Pink roses and a film roll descend down the wearer’s arm leading to a black and gray pocket watch. 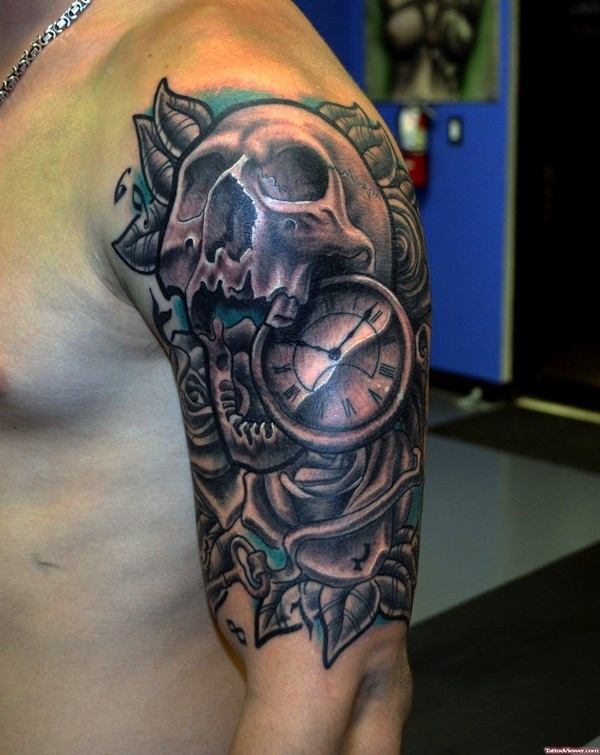 A blue background accents this black and gray piece featuring a skull and a pocket watch. 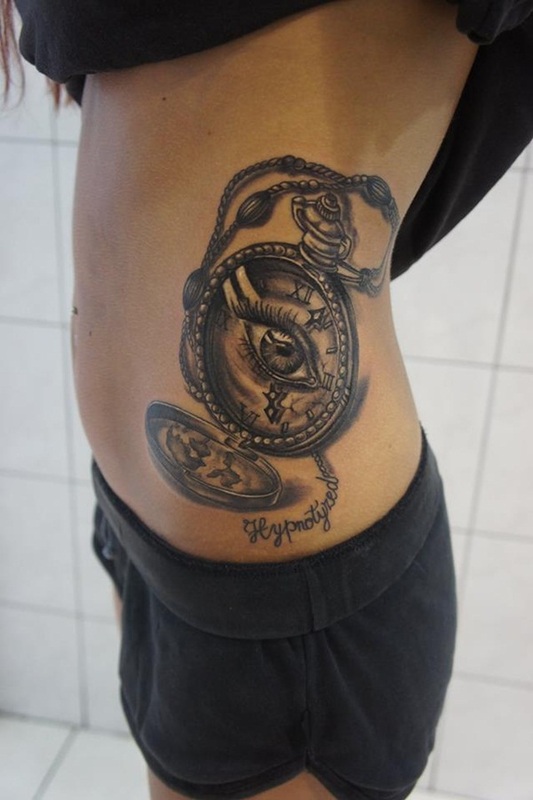 A skeleton watch and skeleton key are surrounded by a swirling design. 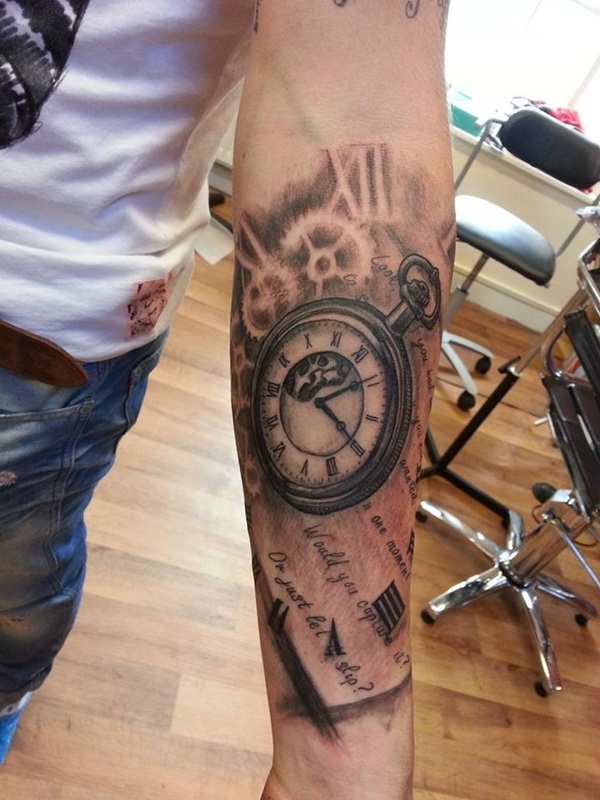 A broken pocket watch spills gears and roman numerals onto the wearer’s arm in this tattoo. 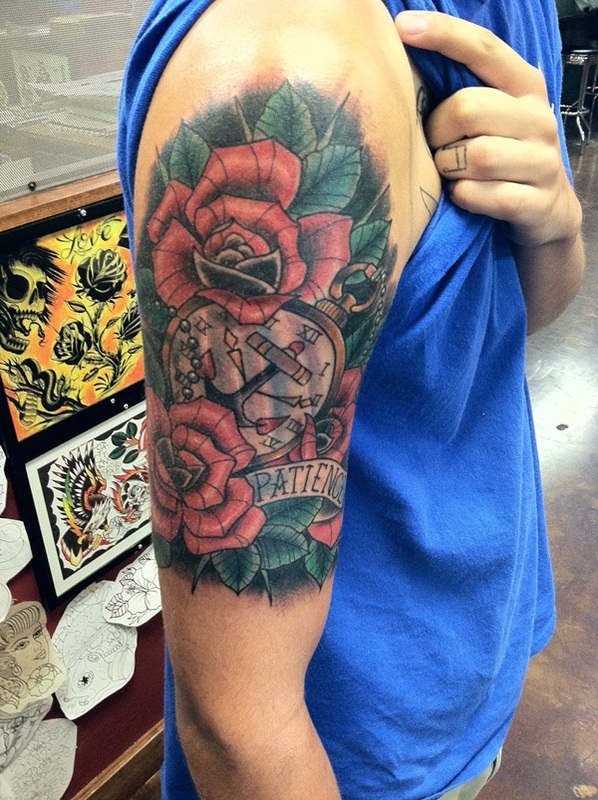 This life-like piece features a gold skeleton pocket watch, two flowers, and a bottle on the wearer’s forearm. 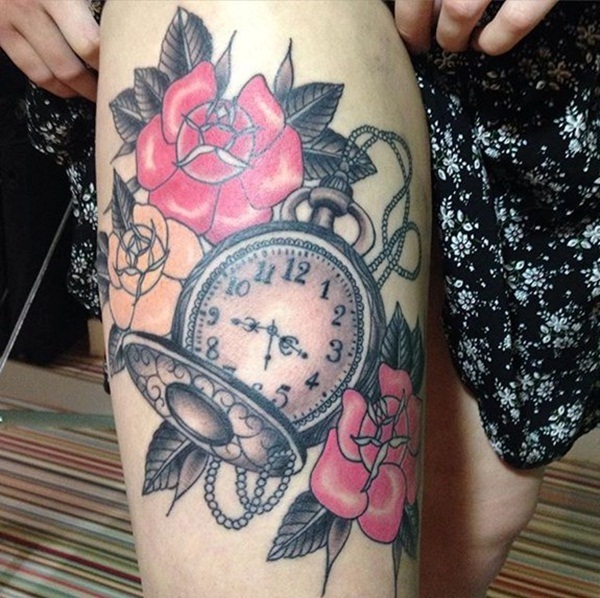 A pocket watch and rose are featured in this traditionally styled thigh piece. 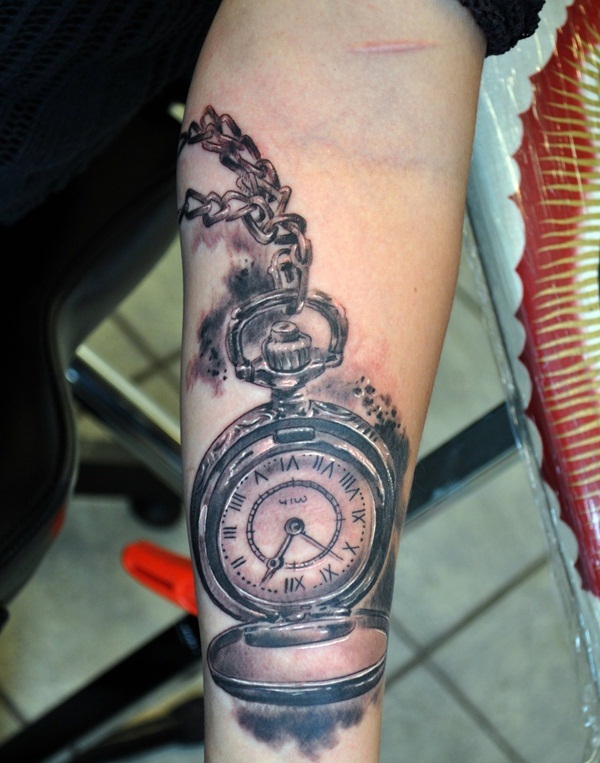 This black and gray piece, featured on the wearer’s forearm, pictures an hourglass and a pocket watch. 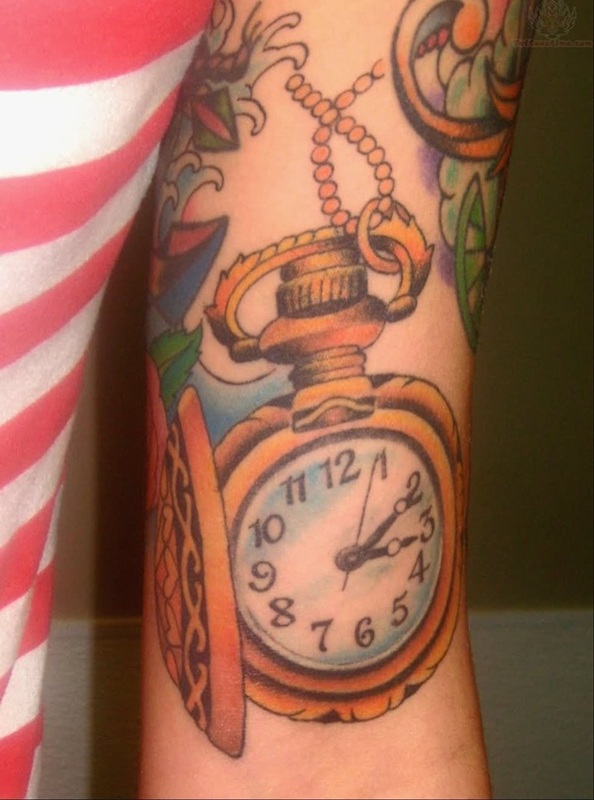 A traditionally styled gold pocket watch is the centerpiece of this forearm tattoo. 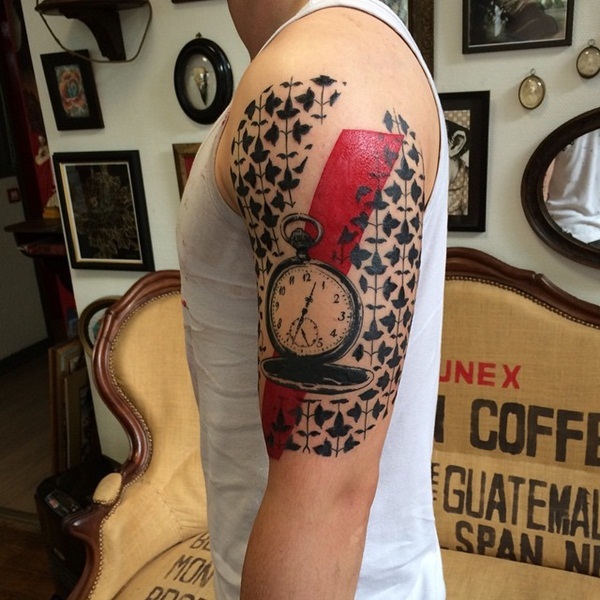 A red slash serves as the background of this piece featuring a repeating leaf pattern and a black and gray pocket watch. 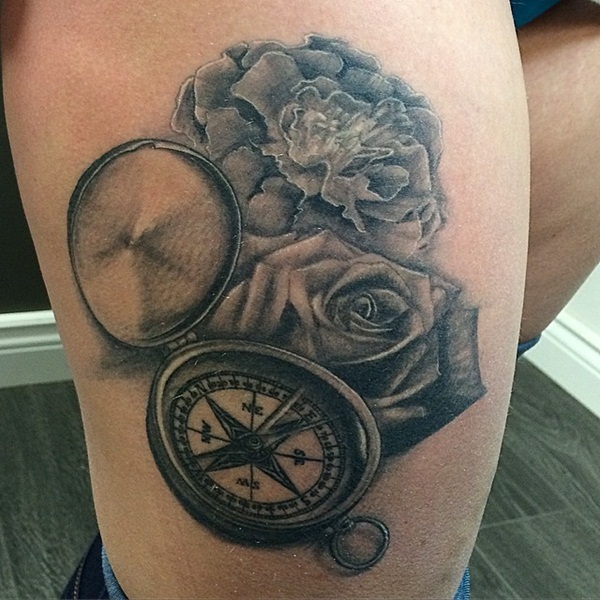 A compass is accompanied by a pair of flowers in this black and gray piece. 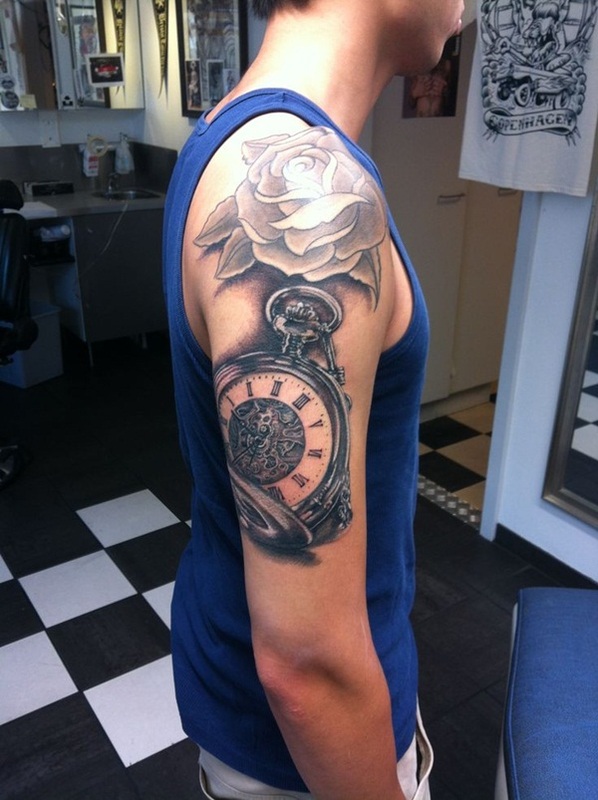 Traditional styling is used to depict a gold pocket watch and red rose on the wearer’s upper arm. 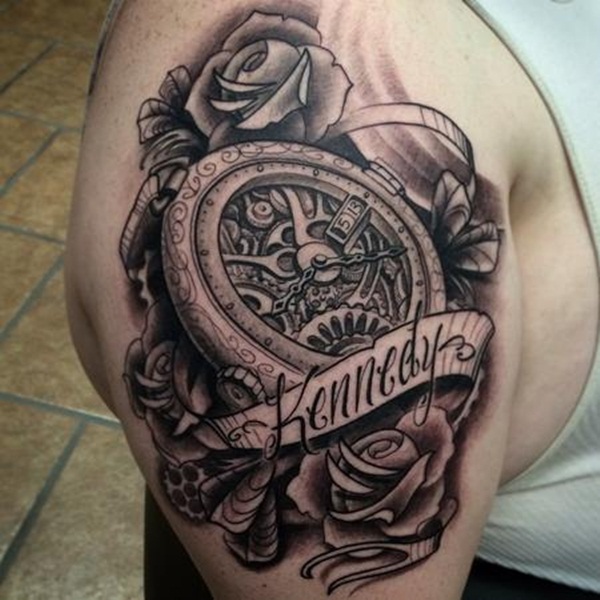 Black and gray ink composes a pocket watch sitting between two roses in this piece. 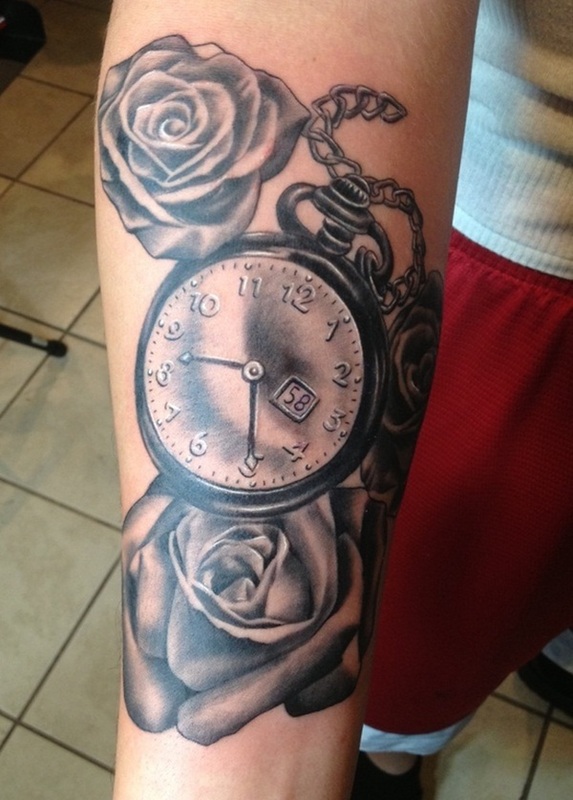 A skeleton pocket watch sits above a rose in this black and gray piece. 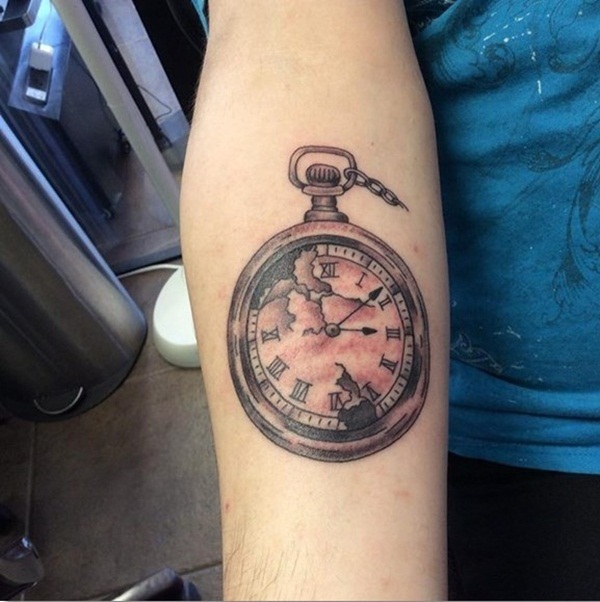 A mediocre example of a black and gray pocket watch.